See all 111 Luxury ideas for kitchens. 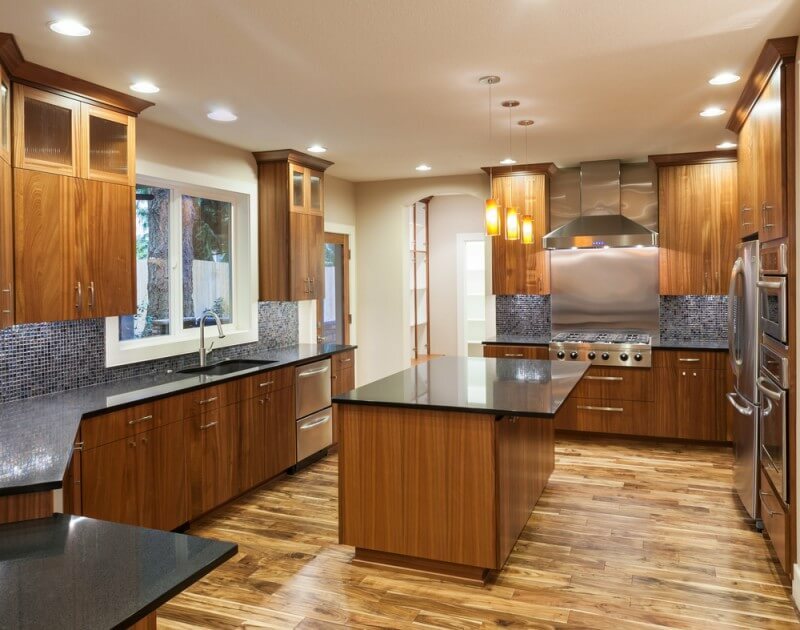 These designs will blow you away with their beautiful kitchen counter tops, backsplash, islands, cabinets and more. 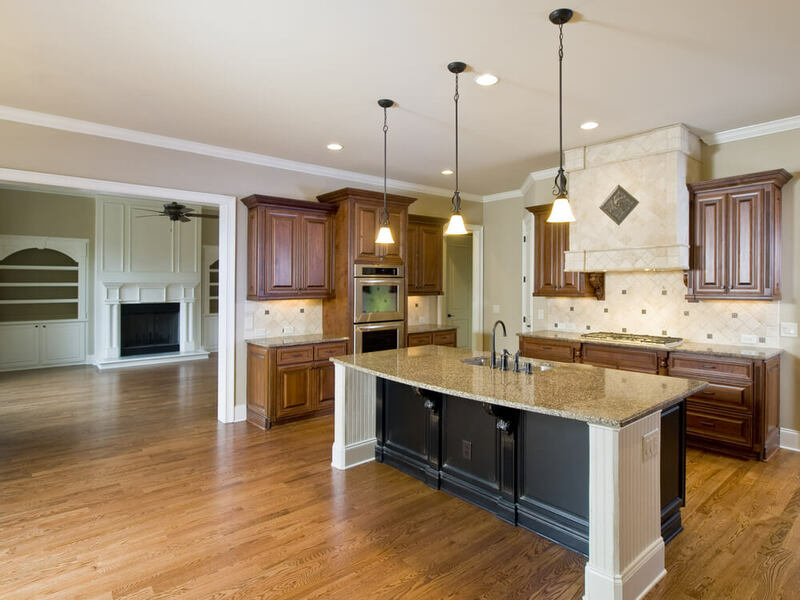 Depending on the homeowner, what constitutes as an amazing luxury kitchen can vary. 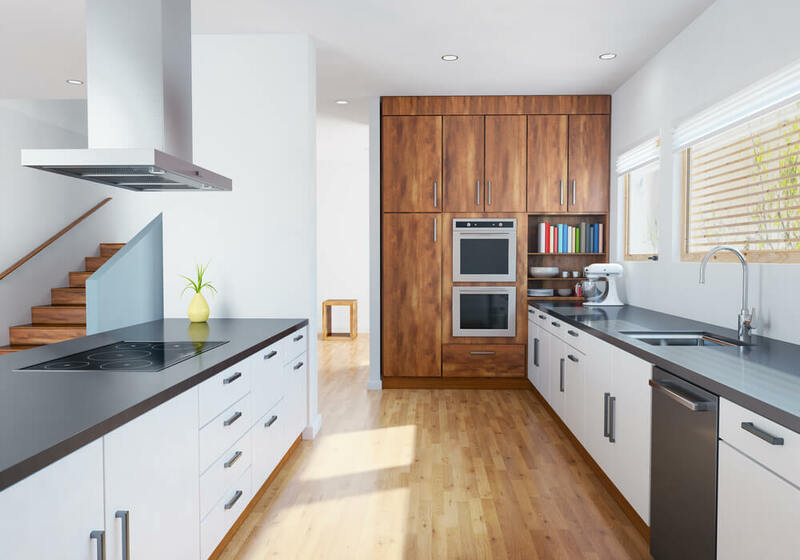 For those with modern interior design leanings their dream kitchen will feature glossy, flat-paneled cabinetry, lots of horizontal lines and natural materials. 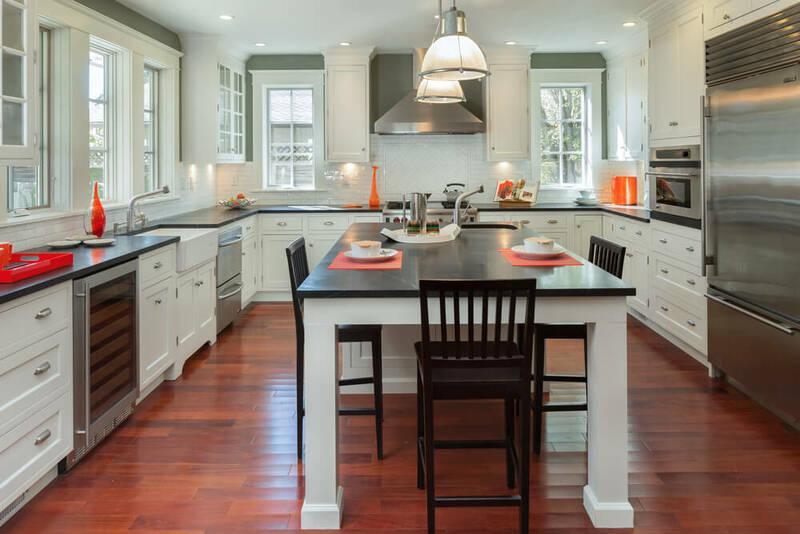 A lover of country kitchens will likely choose Shaker-style cabinetry, a large farmhouse sink, as well as a mix of butcher block and marble surfaces. However, there are particular design elements that exude luxury wherever they are installed. Solid stone surfaces are always luxurious. 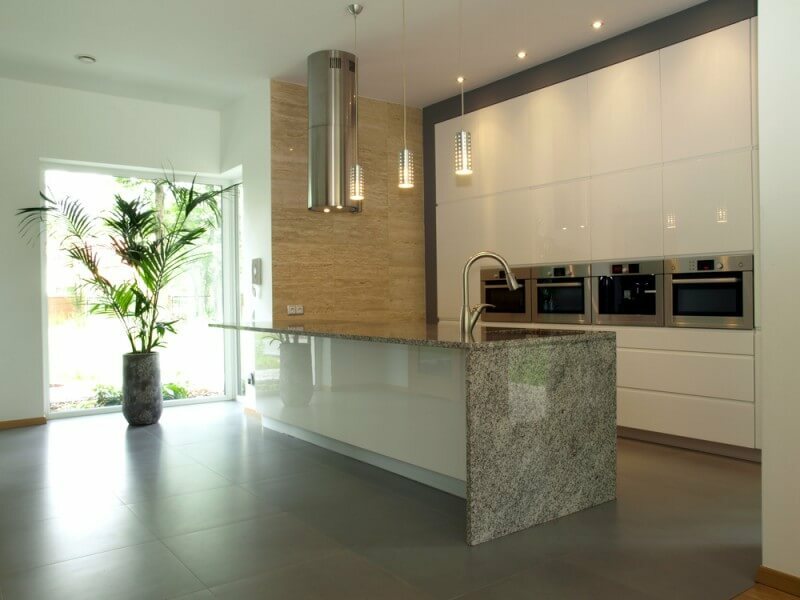 Whether they are marble or granite, these surfaces are an essential part of an amazing kitchen. 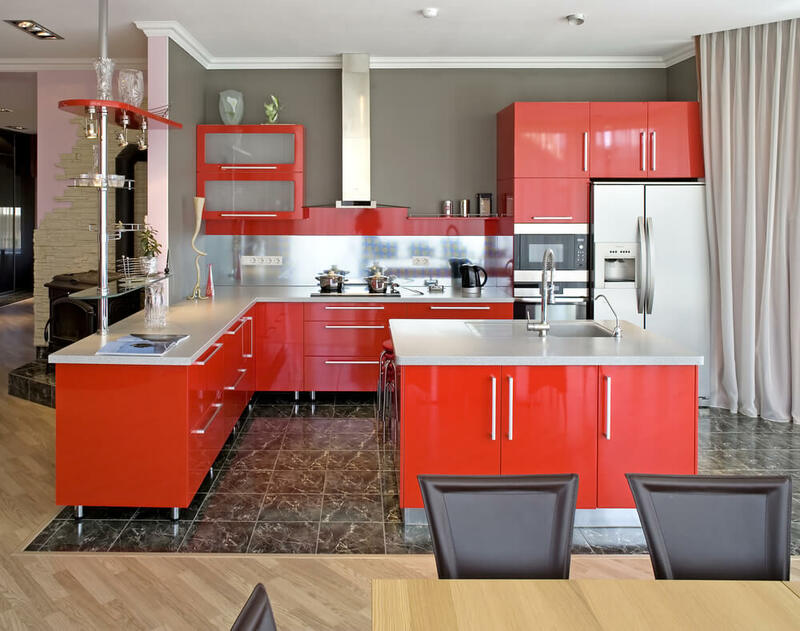 When choosing a solid surface for your kitchen it is important to consider the features of the material. 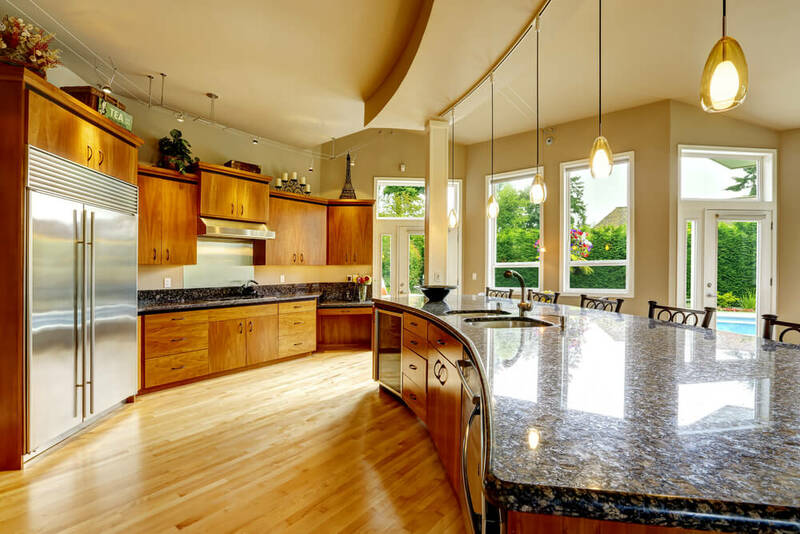 While both are durable, granite is much tougher than marble and less susceptible to scratches and chipping. Marble is more porous which can cause it to absorb stains if not properly sealed. 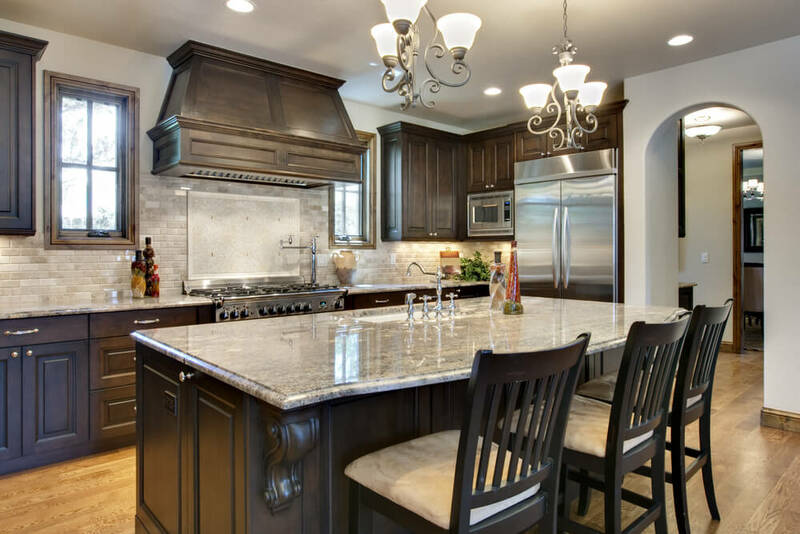 Granite and marble both need to be sealed every few years to maintain their integrity. However, when properly cared for both granite and marble are sure to last for many years to come. 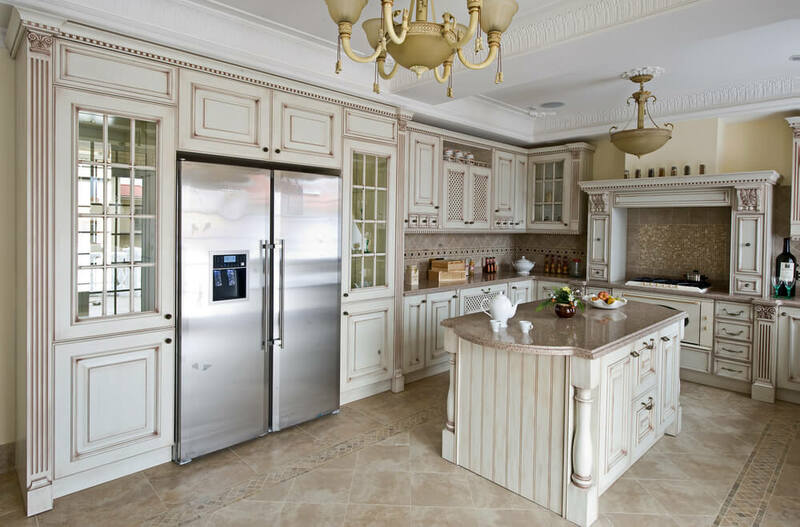 Another feature seen in luxury kitchens is high-end appliances. 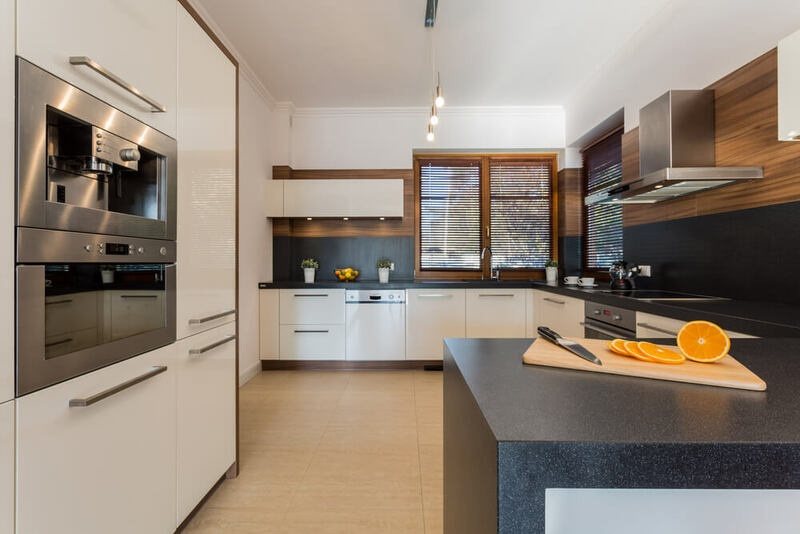 In the past, stainless steel has been the style of choice, but more recently homeowners have begun experimenting with retro, white or black appliances, depending on their design aesthetic. High-end appliances are designed with equal amounts of function and design in mind. Therefore, they tend to exude luxury in comparison to lower-end models. Gas ranges are often considered to be ideal for their ability to quickly cook food at a consistent temperature. Additionally, other luxury features can include multiple burners, convection ovens and the ability to cook multiple dishes at one time. 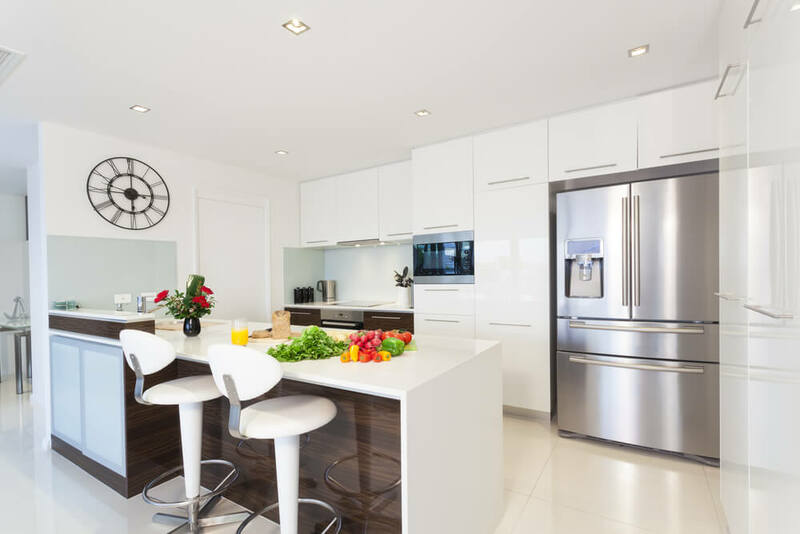 Your kitchen contractor or interior designer will be able to help you choice the best appliances for your space based on your practical needs and design style. 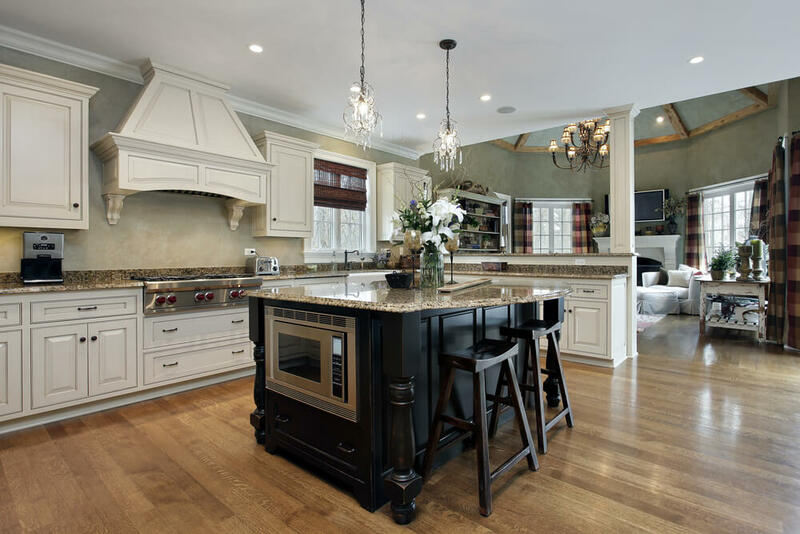 Large, custom islands are another element often found in a luxury kitchen. 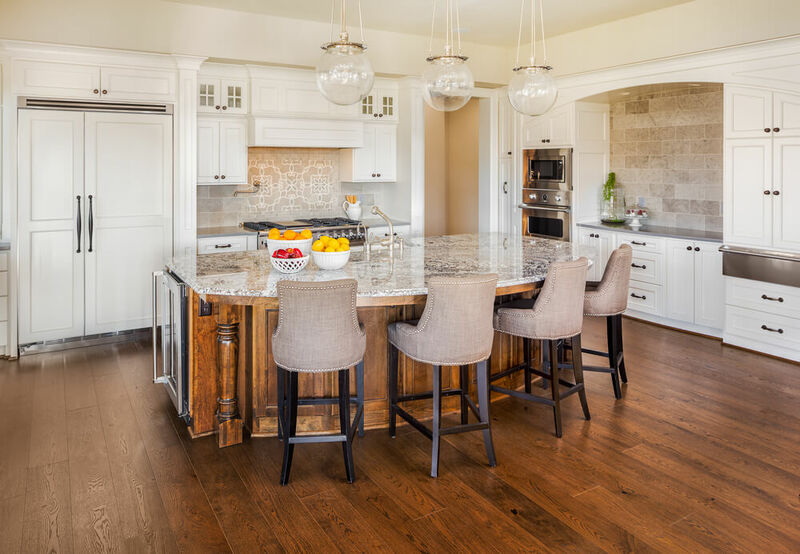 The size of an island will vary depending on the square footage available but is nonetheless valuable as to offers additional space for food prep and an area for guests to congregate while a meal is being prepared. 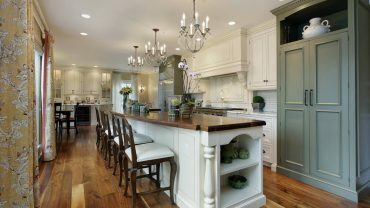 Custom islands can feature details like decorative legs, beadboard, open shelving and even space to incorporate a sink, cooktop or microwave. An elegant addition to an island is the installation of countertop that extends to the floor, providing a waterfall effect. If space allows, a truly spacious kitchen can even accommodate multiple islands to serve the various functions performed in the space. While not often considered, an abundance of windows and natural light can be a lavish feature in a kitchen. 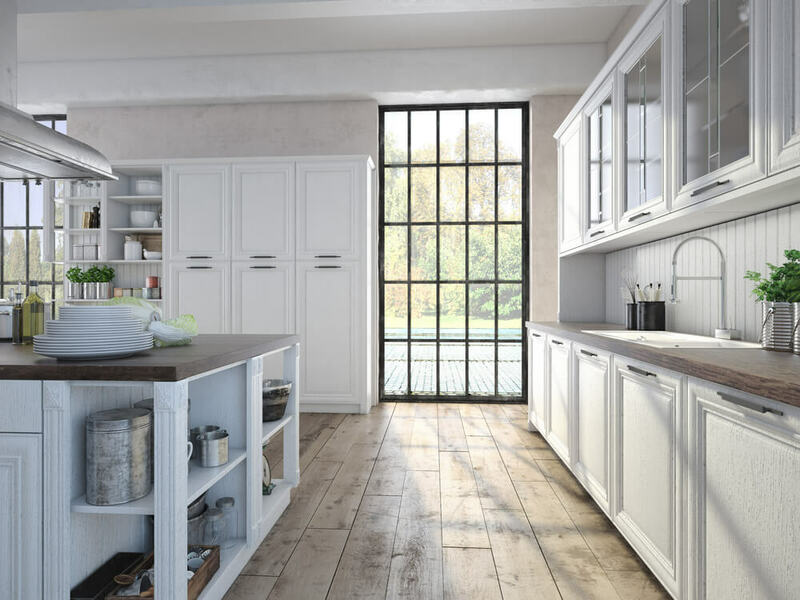 Smaller kitchens are not afforded to luxury of windows as they tend to take up valuable space typically used for upper cabinetry. However, a large kitchen, depending on its location within the home, can often accommodate both windows and upper cabinetry. The result is a space that is airy, inviting and ideal for hosting family and friends. 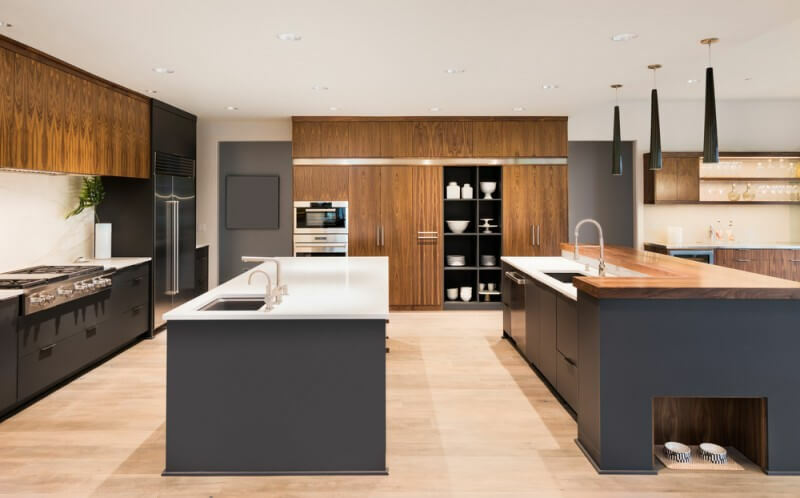 Whether you are undertaking in a full kitchen remodel or redesign, view our gallery below of interior decorating photos, for ideas and inspiration on how to incorporate luxury in your kitchen space. 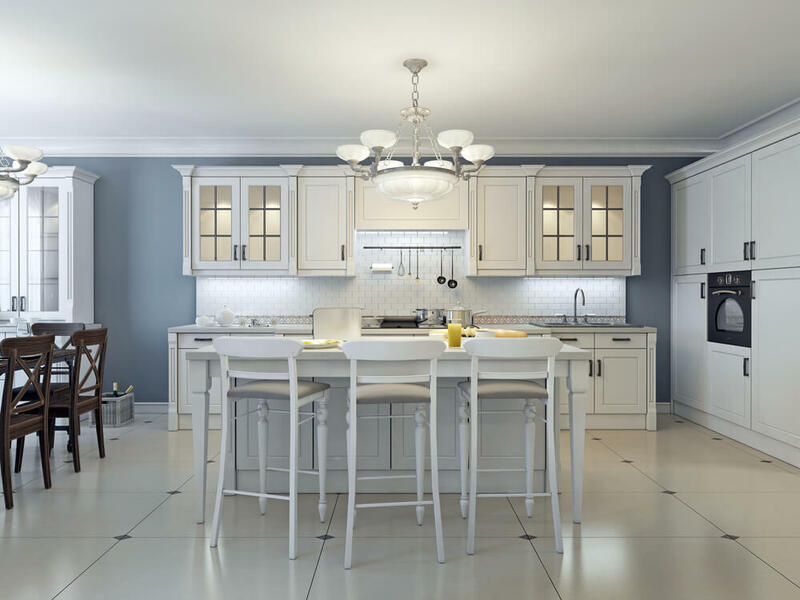 If you aren’t sure where to begin consider hiring a kitchen contractor or interior designer to guide you through the process. 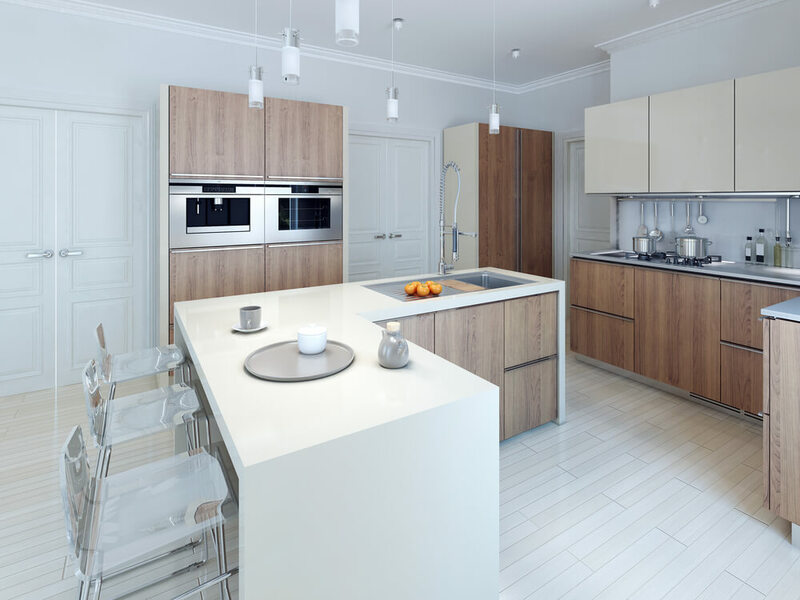 By enlisting the services of a kitchen contractor or interior designer you can effectively reduce the stress and frustration typically felt when renovations are involved. The wood accents in this all-white kitchen reflect the style of this open-concept space. The farmhouse sink provides a vintage touch to this contemporary space. 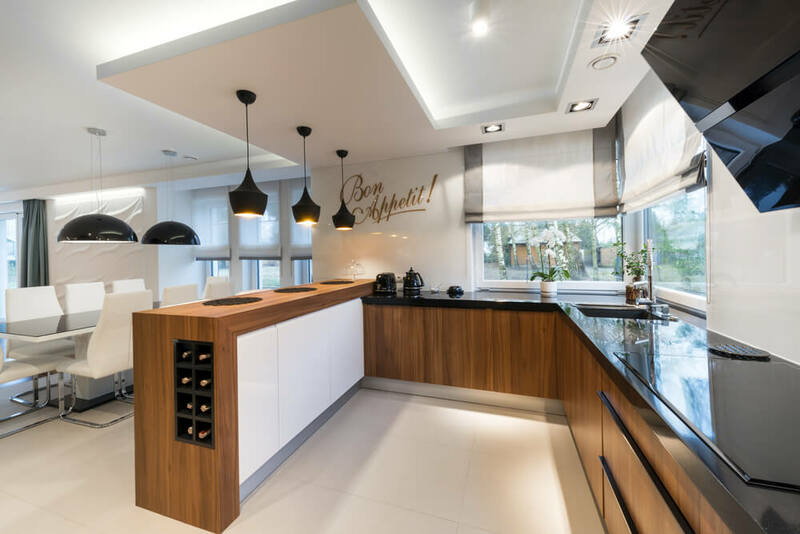 This kitchen is made up of a variety of finishes – wood, stainless steel,tile – that provide warmth and depth to the space. The island and sink area allow those working in the kitchen a beautiful view of the outdoors. 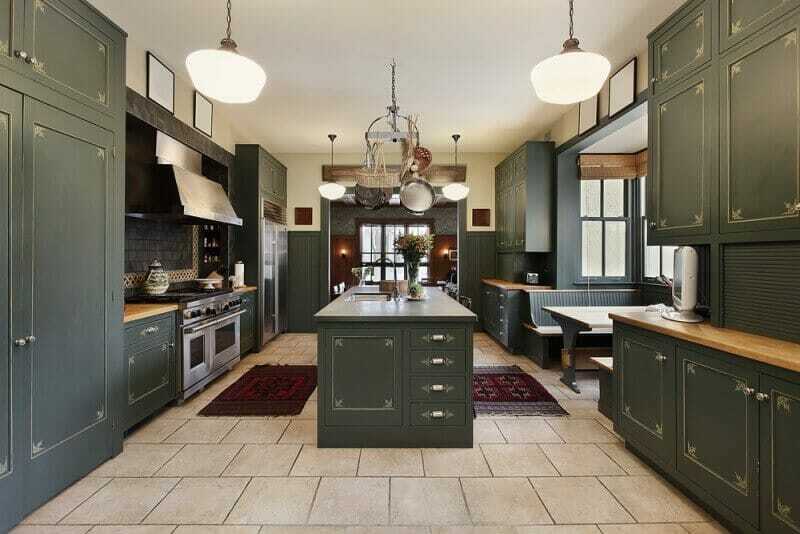 The deep, gray-green cabinets of this expansive kitchen create a dramatic atmosphere. Additional features include a pot-rack, eat-in breakfast area and a large cooktop and range. This spacious island, with rows of large drawers, provides a large surface for food prep, as well as a place to display food and visit. 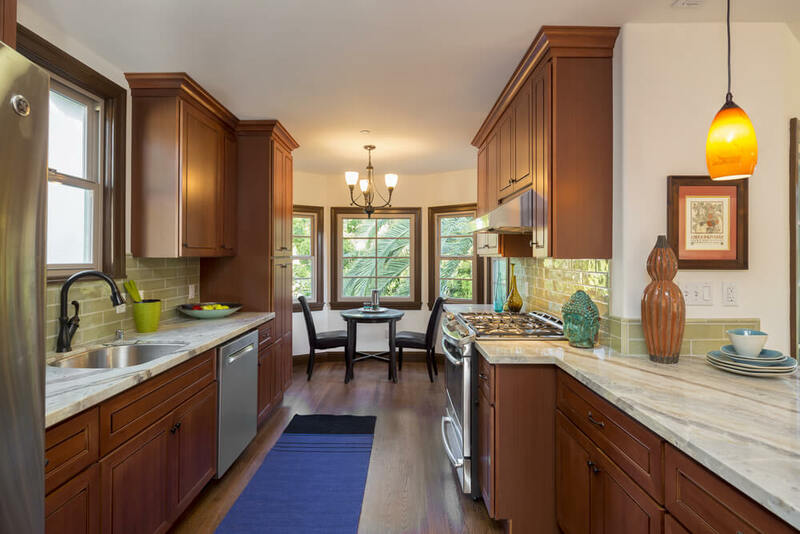 This traditional kitchen contains warm, oak cabinets and coordinating granite countertops. A built-in cook top allows homeowners to interact with family and friends while preparing a meal. The unique design of this kitchen features sleek, floor-to-ceiling cabinetry and an island with a section of open shelving. The dark tile floors provide a stark contrast to the glossy, white cabinetry. 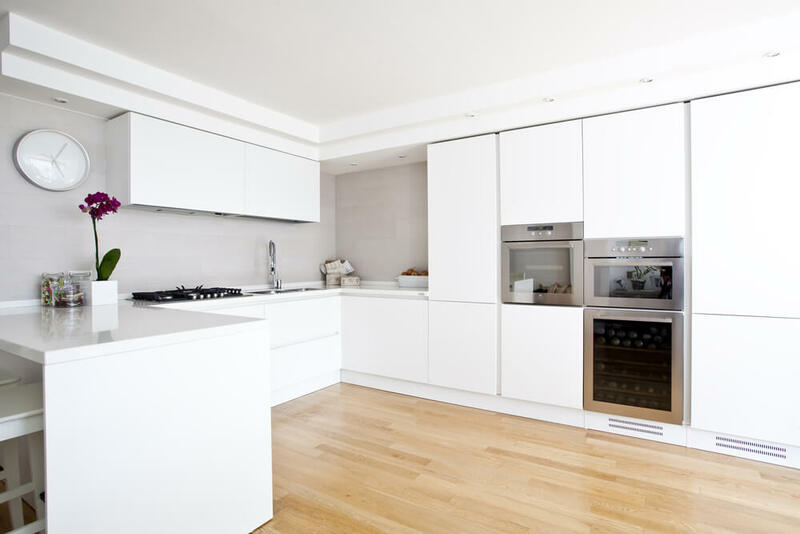 This small kitchen features wood-framed cabinets with sleek, white fronts. A conveniently-sized oven and range provide necessary amenities without sacrificing valuable space. This Mediterranean-style kitchen features tall, wood-paneled ceilings and large windows that provide lots of natural light. 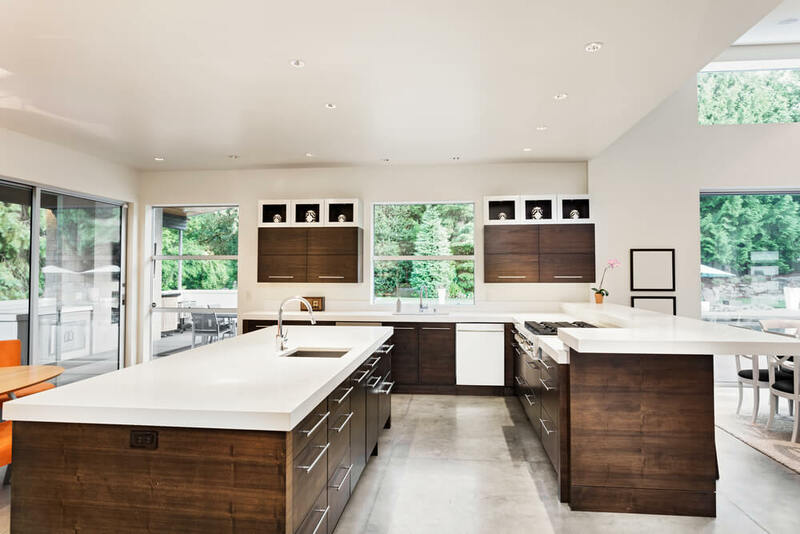 This modern kitchen features two, expansive islands that provide ample storage and two sinks. There is even a custom niche to place place pet food dishes. 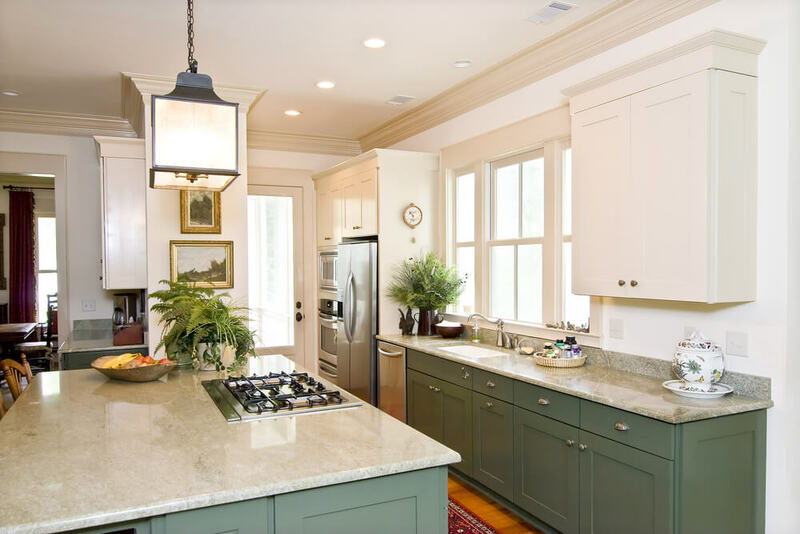 The pale green of the cabinets provide an unexpected splash of color to this neutral kitchen. 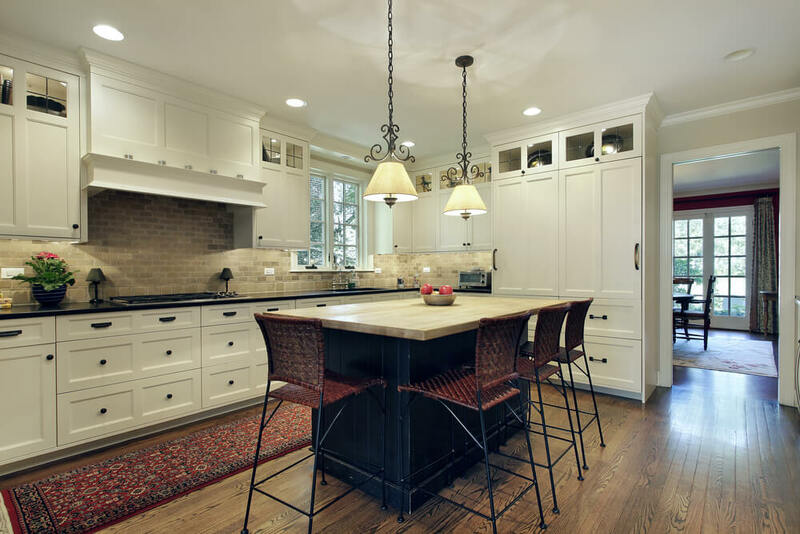 The elegant, pendant lights above the island provide a lots of light and fit seamlessly into the space. This kitchen is uniquely designed to provide lots of functional storage in addition to all the modern conveniences. This art deco kitchen features leaded-glass cabinetry details and a design that is perfectly balanced to provide function and elegance. 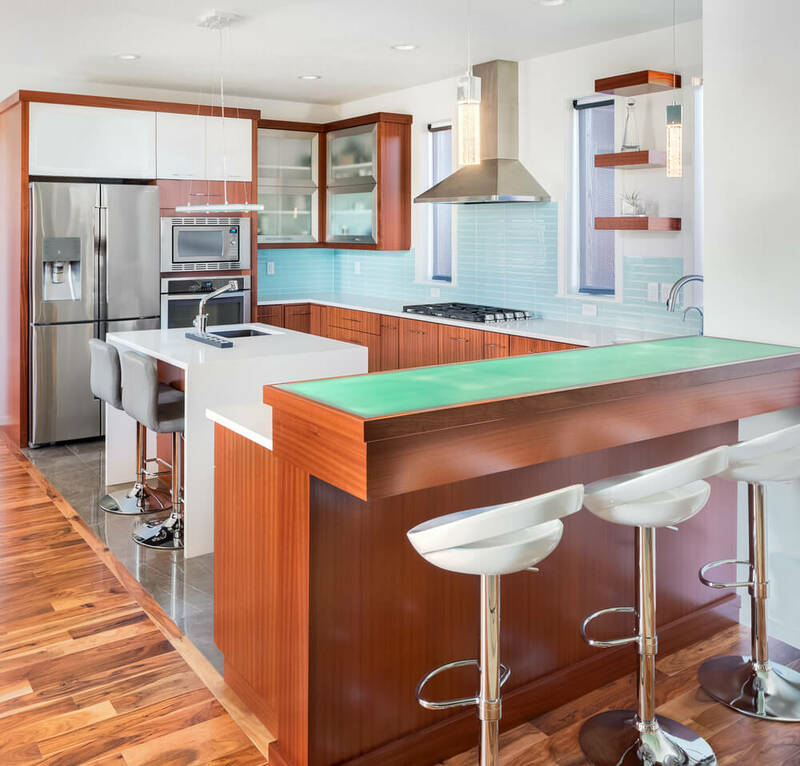 The warm cherry wood and green countertops of this space create a natural design aesthetic. Double ovens and an integrated refrigerator provide added luxury. 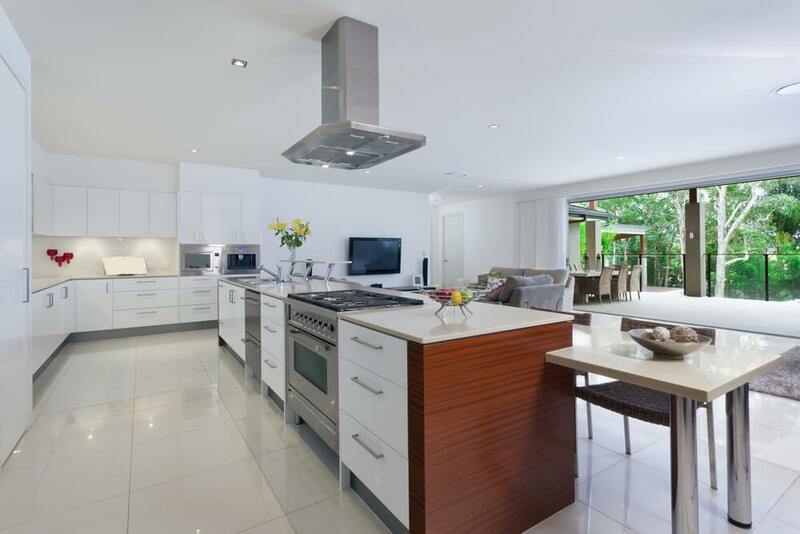 This kitchen features modern cabinetry and an uncomplicated layout. These features make it ideal for its location in a high-rise apartment. This bright and airy kitchen features dark wood cabinetry and contrasting, solid surface countertops. Multiple horizontal work areas provide lots of space for food prep, display and clean up. This kitchen contains plenty of storage without integrating additional upper cabinetry. The wall of cabinetry provides space for built-in ovens and some open storage for cookbooks and culinary accessories. 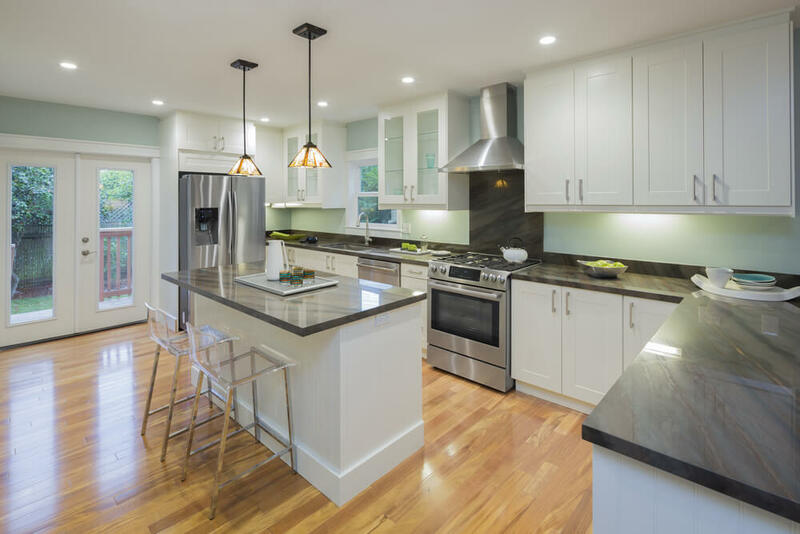 This contemporary kitchen features shaker-style cabinetry and stainless steel appliances. 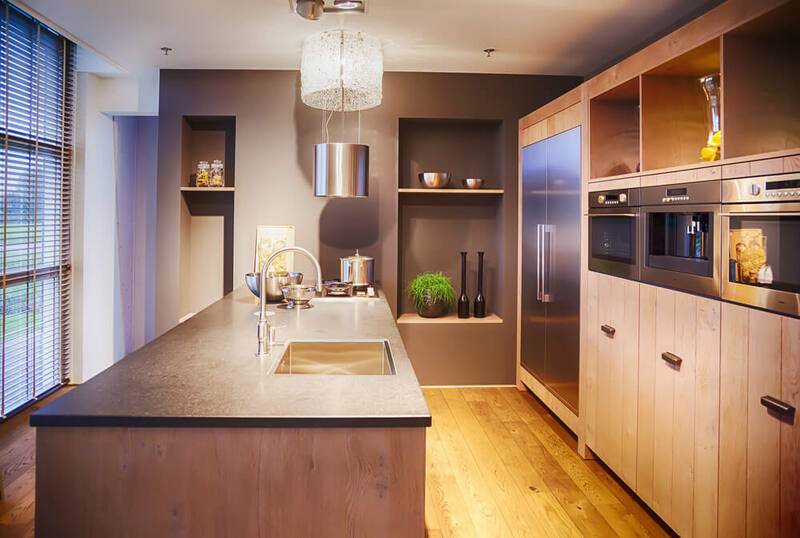 The countertop surface is continued vertically, behind the stove, to provide protection from food debris and to provide a focal point for the space. 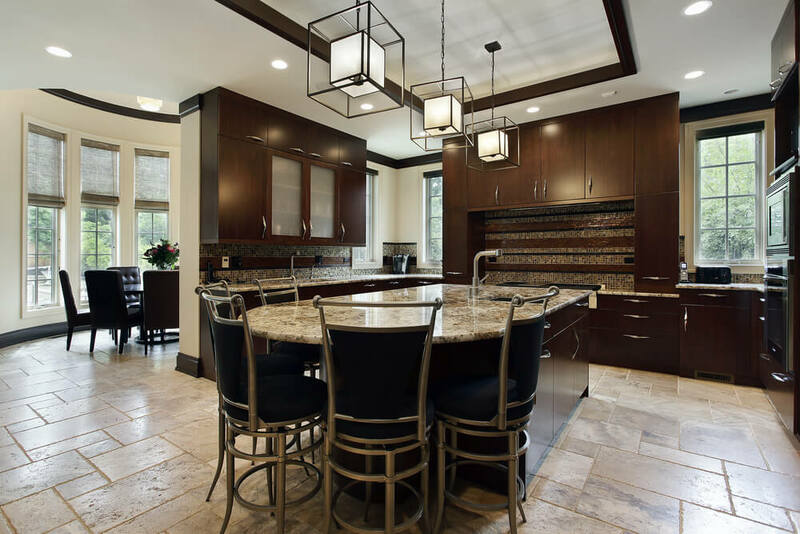 This elegant kitchen contains plenty of detail and ornamentation, from the custom island with gold detail to checkerboard tile pattern behind the cooktop. 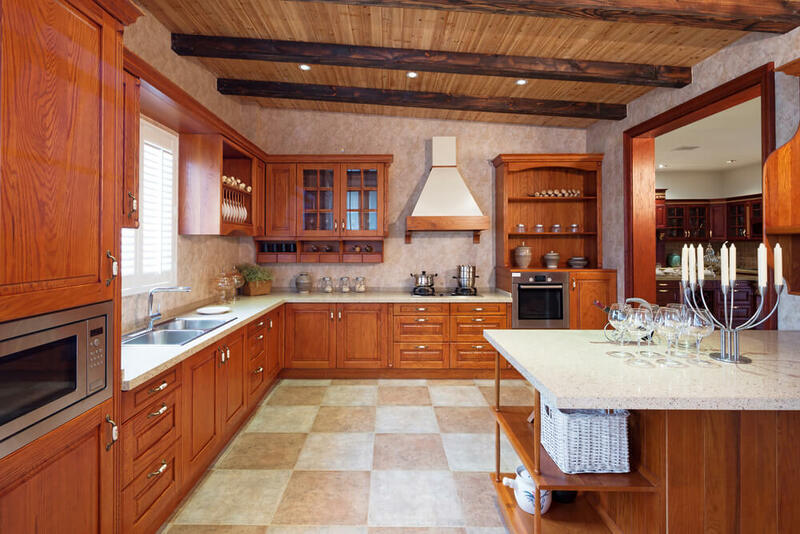 The warm oak cabinetry and custom uppers create a country aesthetic in this spacious kitchen. 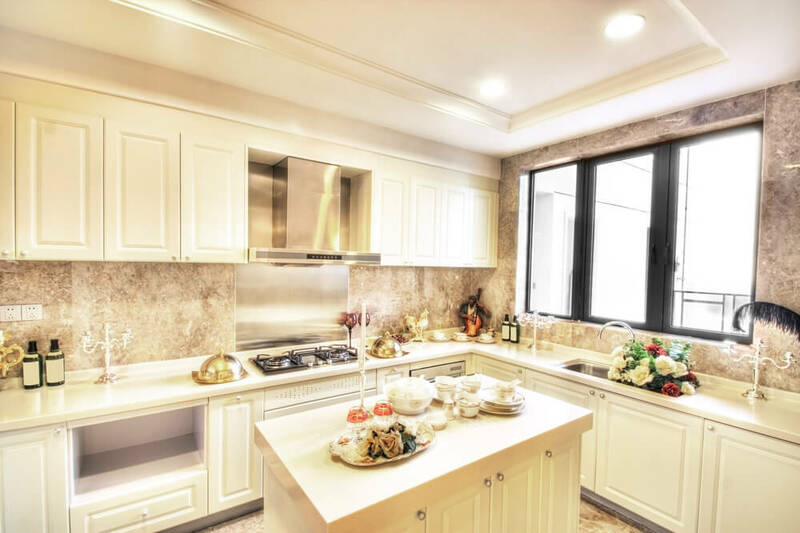 The creamy granite countertops are the perfect compliment to the tone of the wood cabinetry. 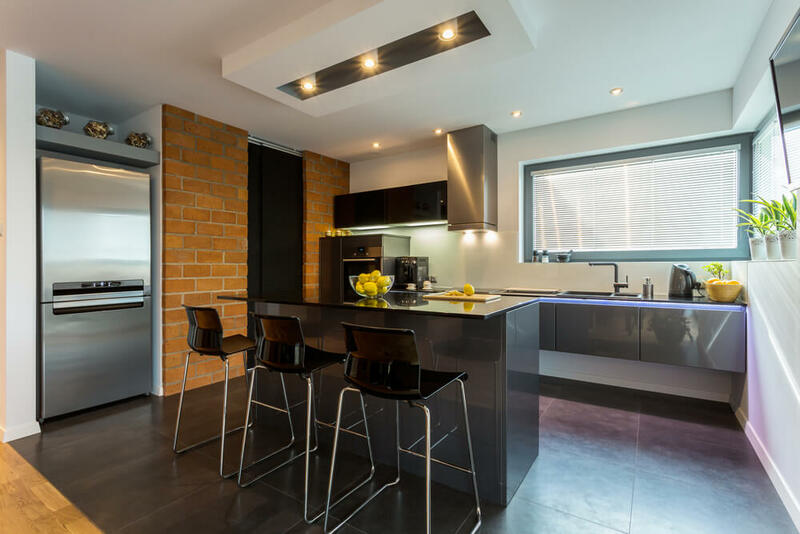 This kitchen features sleek, cabinetry and a textural, brick feature wall. The wall niche provides an ideal place to house the refrigerator. 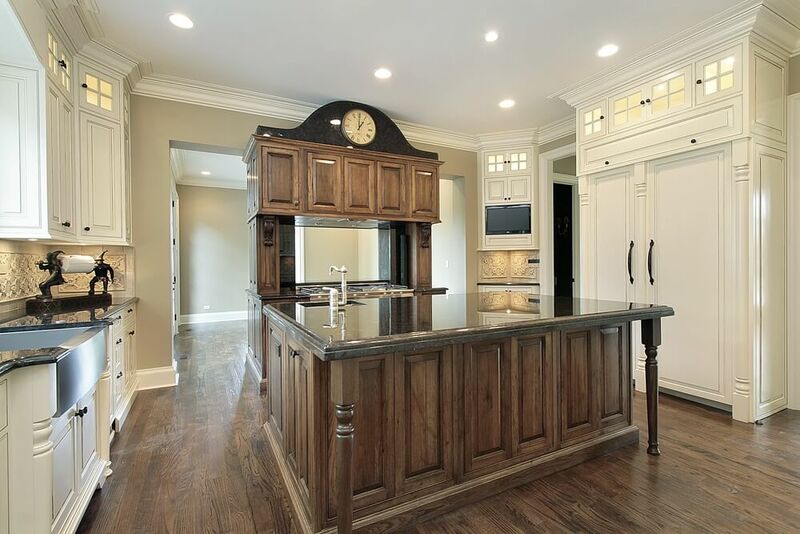 An L-shaped island provides space for a breakfast bar and clean up area. 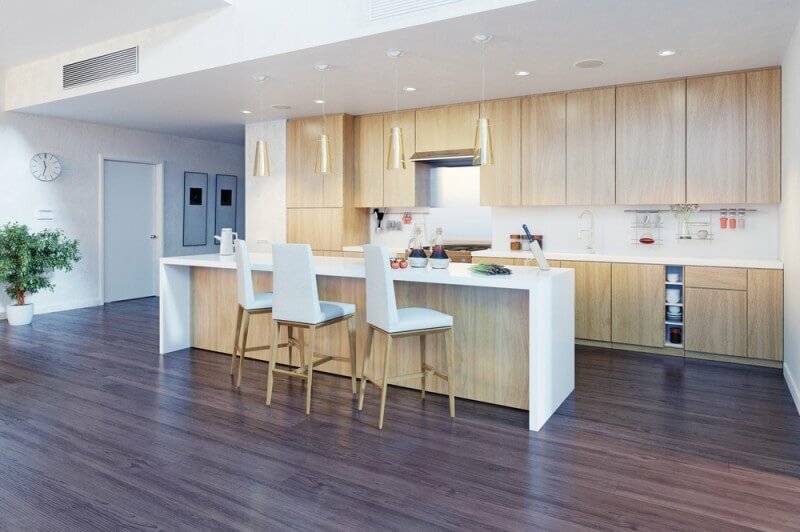 The wood grain and tan cabinetry provide a simple, neutral backdrop to the space. 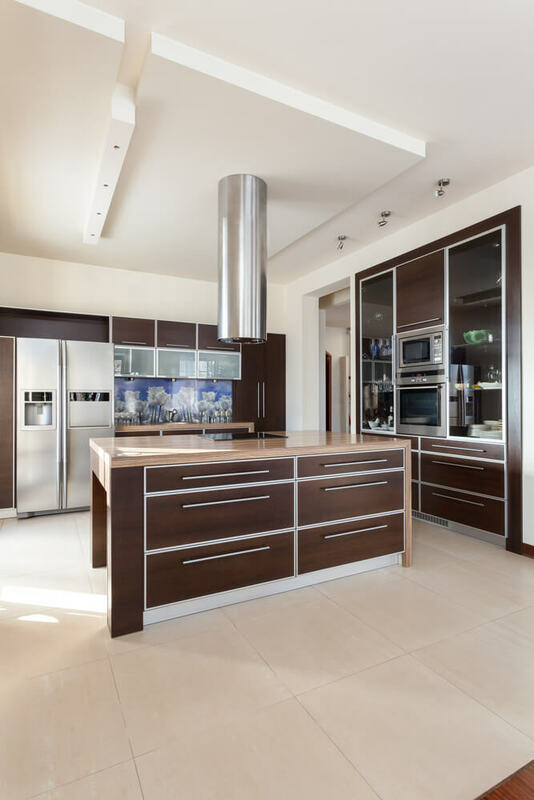 This kitchen’s full height cabinetry ensures that ample distribution of storage throughout the space. A colorful, mosaic backsplash provides a touch of sparkle. This country kitchen features an impressive, vintage stove surrounding by glossy, white subway tile. The ceiling’s wooden beams provide an additional architectural detail. This kitchens integrated fridge makes it seem as though it isn’t even there. 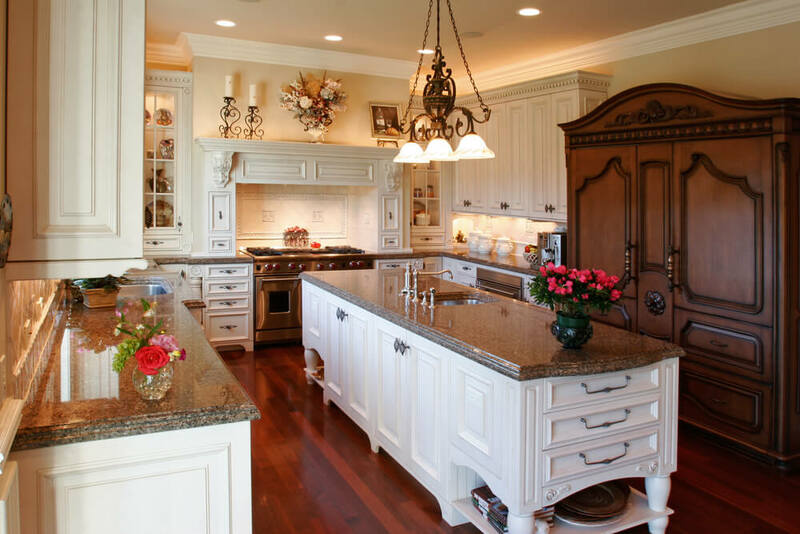 Double islands ensure that there is plenty of space for a variety of kitchen tasks. 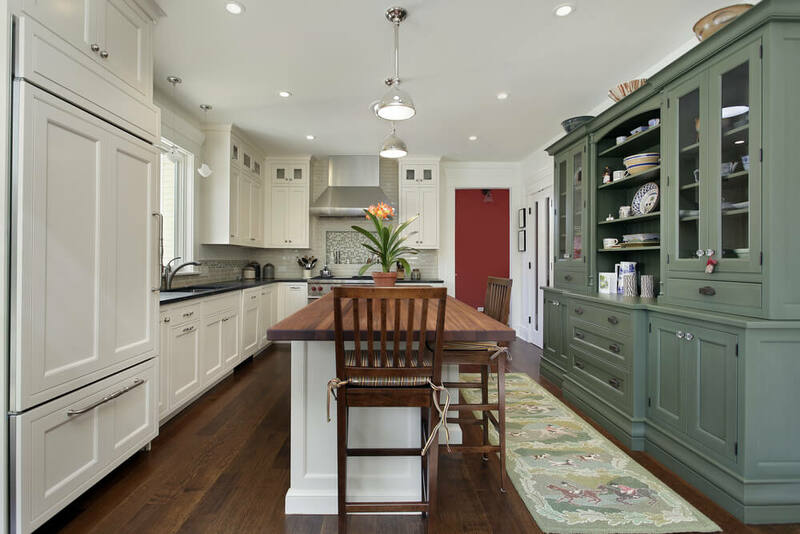 This space is made to feel much larger by painting the walls to blend with the cabinetry. A mirrored backsplash reflects the available natural light which also makes the space feel more expansive. The long, narrow peninsula serves as a breakfast bar, as well as additional storage. An applique phrase provides an unexpected decorative touch to the space. A large opening in the the far wall provides a view of the attached living areas without creating entirely, open concept space. The stone flooring coordinates with the rest of the kitchen by providing a color palette for the space. 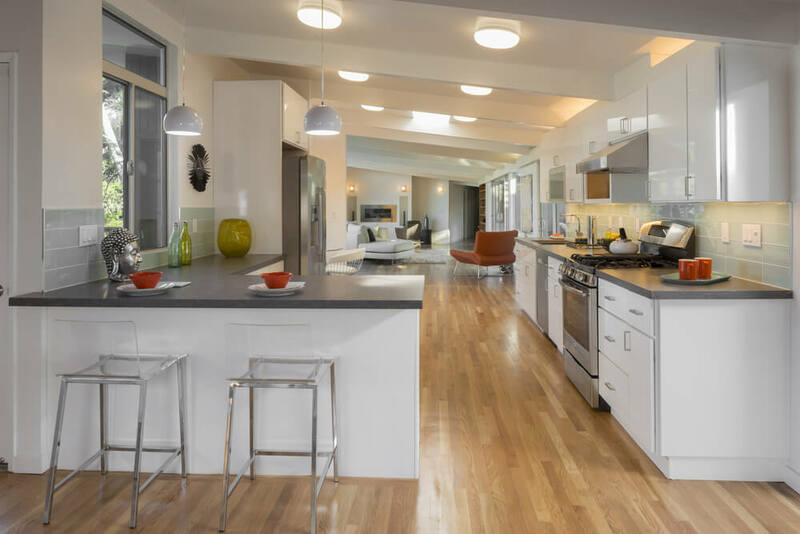 With open sight lines to the dining room and living area, this modern kitchen features a stacked tile backsplash, breakfast bar/island and wide plank, wood flooring. By incorporating an island, rather than a continuous u-shaped counterspace, this kitchen allows a free flow of traffic throughout the space. This kitchen is designed to keep the clutter at bay by incorporating a large pantry, a wall of stacked cabinetry and an expansive island. This sleek, modern kitchen is designed with a vintage aesthetic in mind but with the all the conveniences of modern kitchen design. This modern country kitchen features white cabinetry, wood countertops and floor-to-ceiling windows. A large pantry provides space for kitchen supplies and small appliances. This kitchens features a unique backsplash with a wood detail. This backsplash accentuates the horizontal lines of this modern kitchen. The backsplash detail installed above the cooktop creates an elegant focal point. An additional area, located beside the built-in, double ovens provides a space for the display of food for dinner parties. 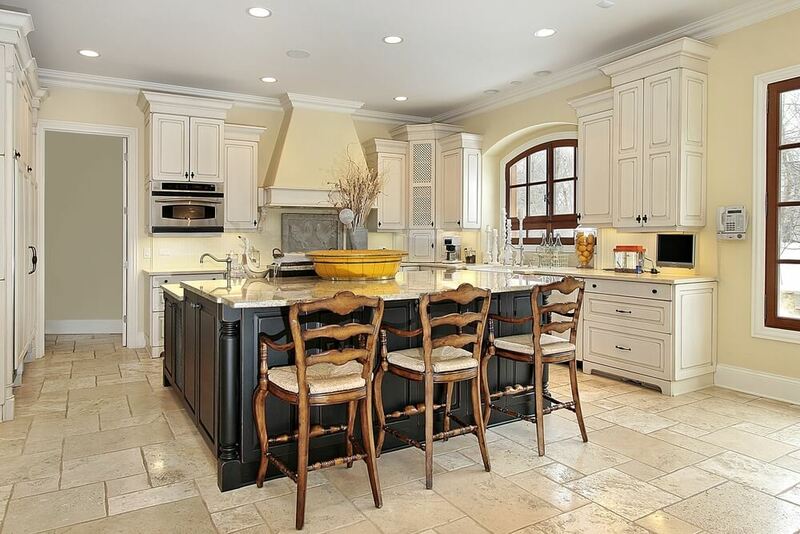 This luxury kitchen features a large island capable of seating up to 5 people. The tall, gray-green pantry, located on one side of the range, provides additional storage and balances the large refrigerator installed on the opposite side. The dark wood plank floors coordinate beautifully with the crisp, white cabinetry. The professional range is embellished with custom woodwork, a glossy white backsplash and an overhanging mantle and corbels. This unique island has the features of a functional kitchen island, as well as a table. The soft, neutral color palette is incorporated in each element of this pace, from the beautiful stone backsplash, to the warm, wood floors. 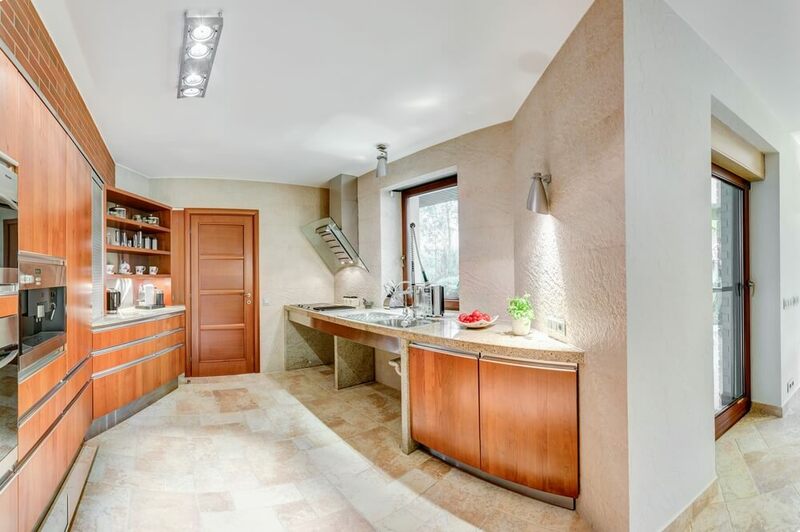 This luxury kitchen is flooded with natural light coming in from the windows surrounding the space. 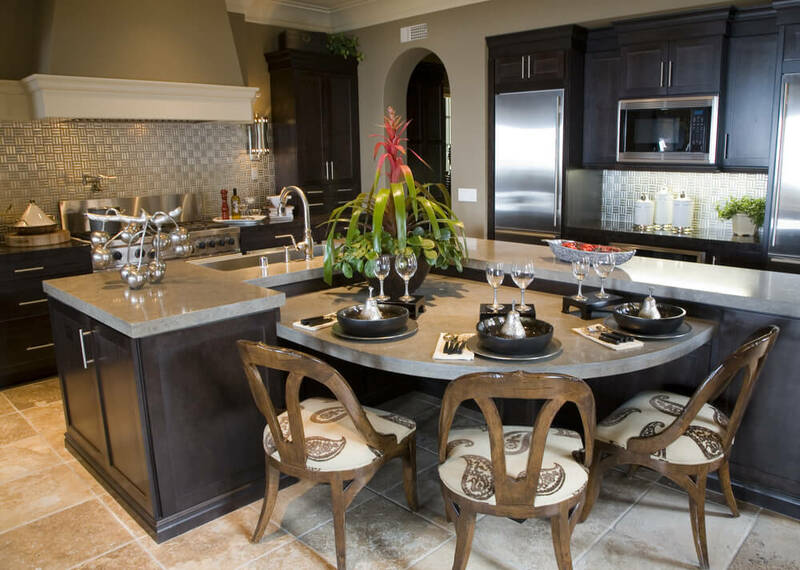 A large, centrally-located island acts as a dining table and provides room for food preparation. 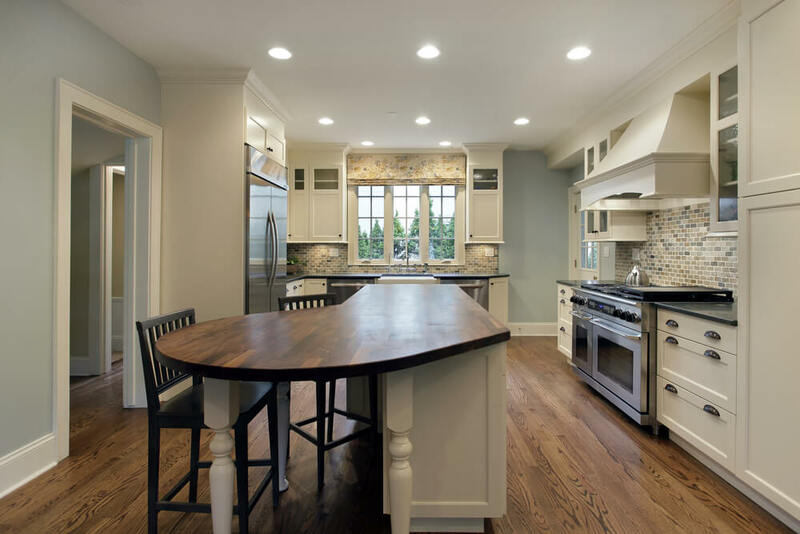 This kitchen makes up for the lack of an island by incorporating lots of uninterrupted counter space. The slanted ceiling and wood beams add an unexpected touch. This kitchen features a wall of dark wood cabinetry contrasted with bright white cabinetry in the remainder of the space. 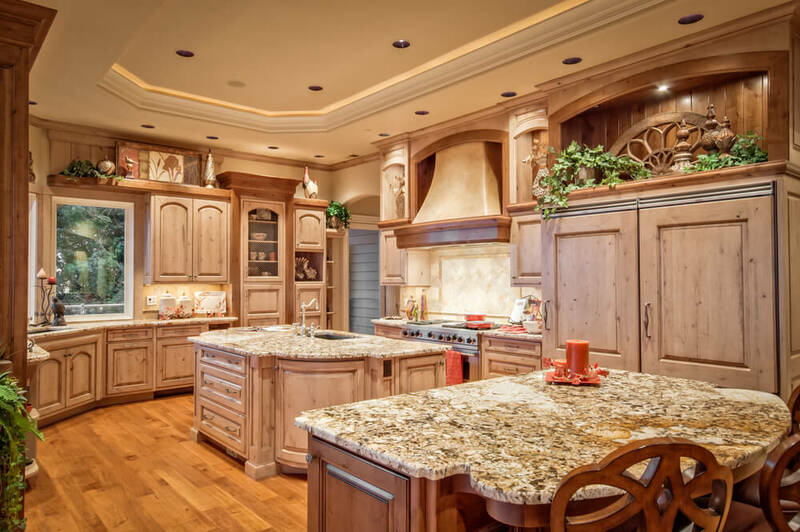 The seamless piece of stone on the island adds to the luxury of this space. 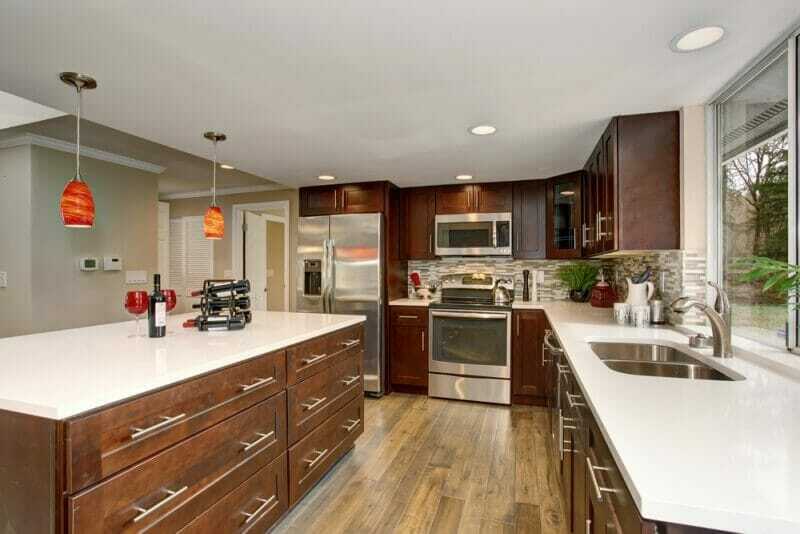 This kitchen features double sinks, built-in appliances, a gas cooktop and breakfast bar. The glossy, blue tile backsplash adds a refreshing contrast to the dark wood cabinetry. This bright and airy kitchen features a massive island with built-in dishwasher and wine fridge. Large windows provide of view of the backyard. This galley kitchen features a solid, stone countertop and a glossy, green backsplash. The backsplash reflects on the lush greenery seen through the bay windows. 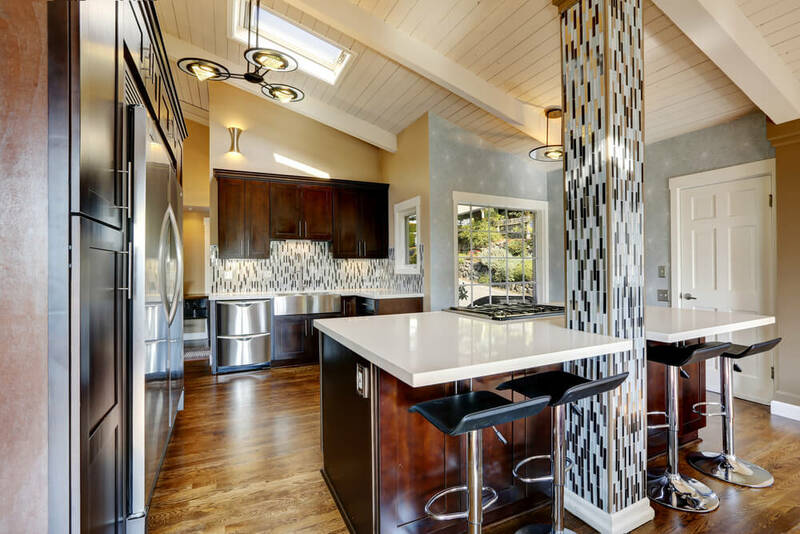 The focal point of this kitchen is the vertical, tiled backsplash and pillar. The brown and blue color scheme of the tile coordinates well with the wood cabinets and glossy, white countertops. 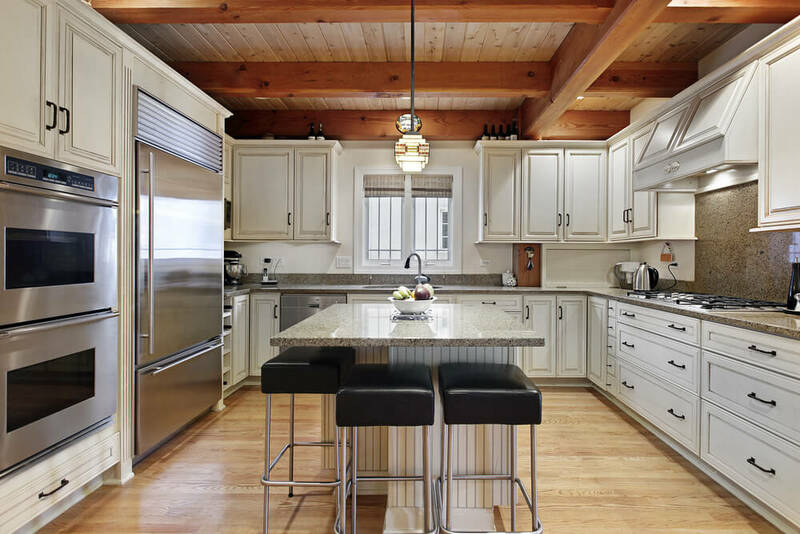 This all-white kitchen features a coffered ceiling, elegant pendant lights and a custom rangehood. This kitchen’s neutral color scheme in showcased in a unique arrangement of rustic natural wood and off-white cabinetry. The crown molding is also painted in a neutral color to pull it all together. 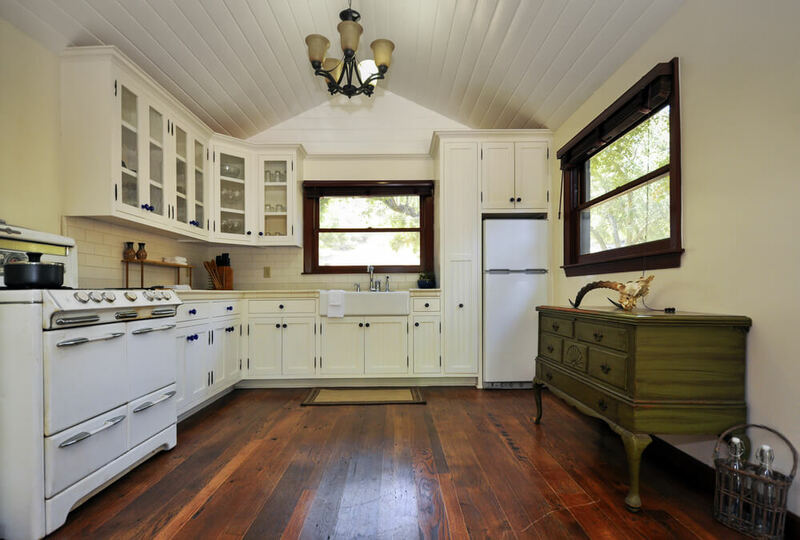 This small kitchen includes a wall of cabinetry and island all constructed with a rustic wood. The wall cubbies provide additional storage for decorative accents and cookbooks. This unique breakfast bar is constructed out of one, large piece of natural wood. The curved line of the wood is left to showcase its natural form. This kitchen is designed in such a way as to not block take away from the high, peaked ceiling and the view from the windows. 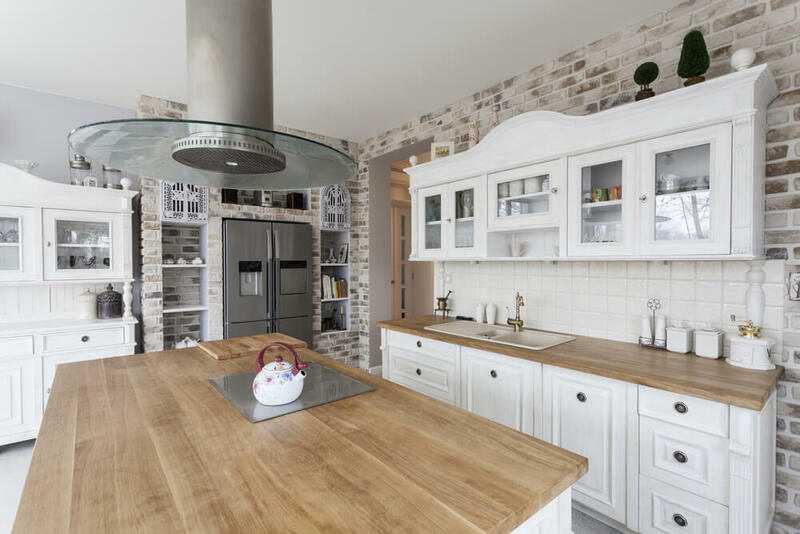 This kitchen adds interest by incorporating various textures such as brick, tile and wood. The refrigerator is uniquely located within a niche in the brick wall. 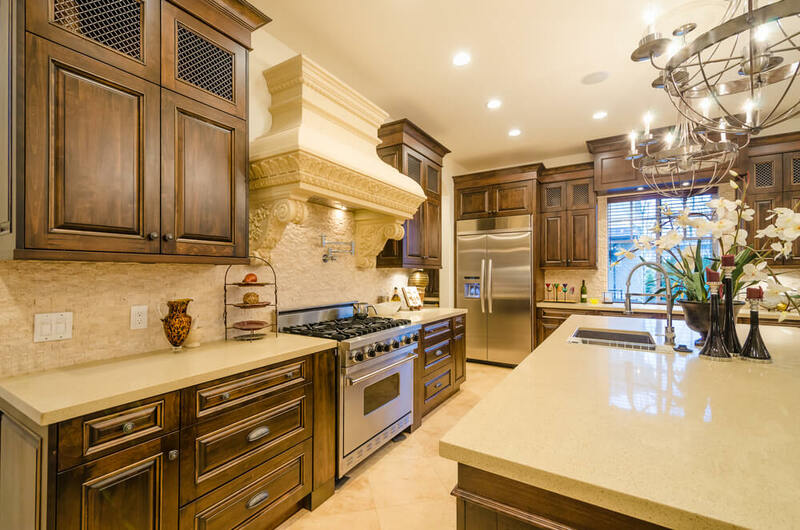 The custom range hood and decorative corbels are the showstopper in this luxurious kitchen. A tumbled stone backsplash at additional texture while adhering to the color scheme. 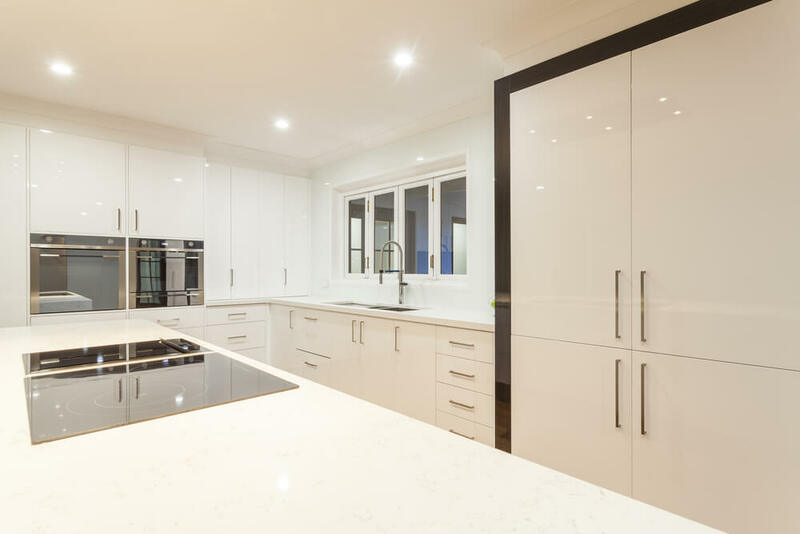 The expanse of white cabinets is interrupted by sections of wood cabinetry treated with a glossy finish. The backsplash provides a delicate influx of color without being too bright. 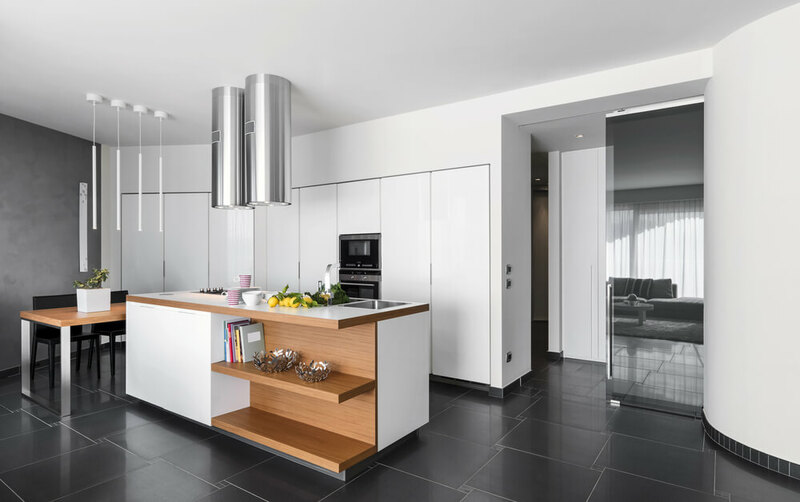 This modern kitchen is designed to display horizontal, rather than, vertical lines. This can be seen in the abundance of large drawers and long, horizontal drawer handles. 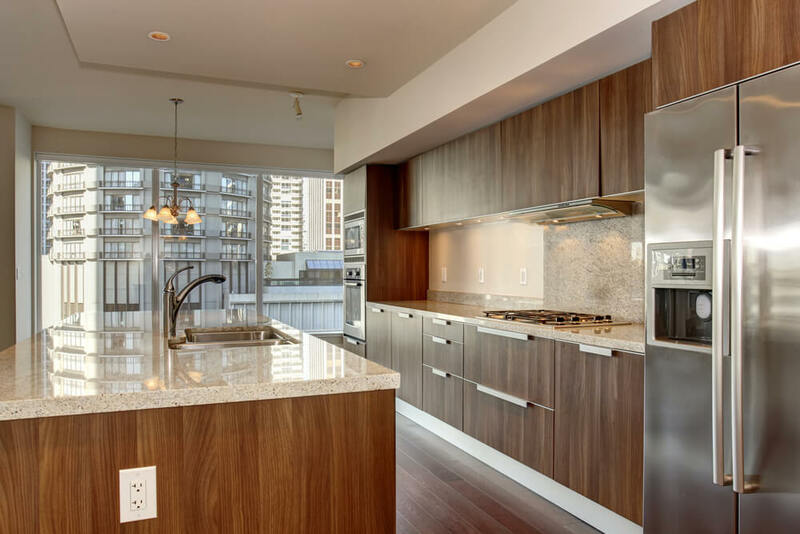 A built in cooktop and microwave create a seamless flow of cabinetry throughout the space. The black, rustic wood island anchors the space will providing a focal point. 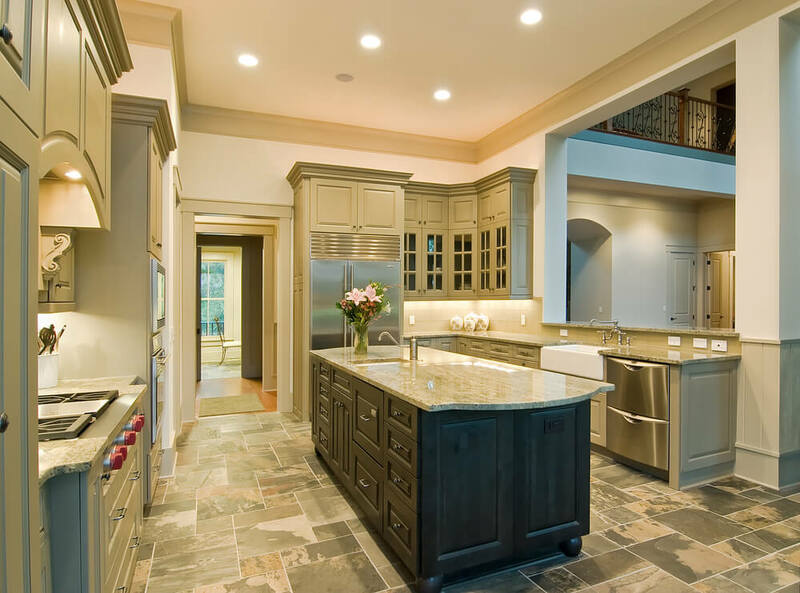 The wall of white cabinetry is accented by a border of slate gray which references the flooring and stone surface of the large island. This kitchen is designed to take advantage of the adjacent outdoor space. The curvature of the island allows traffic to flow easily to and from the outdoors. 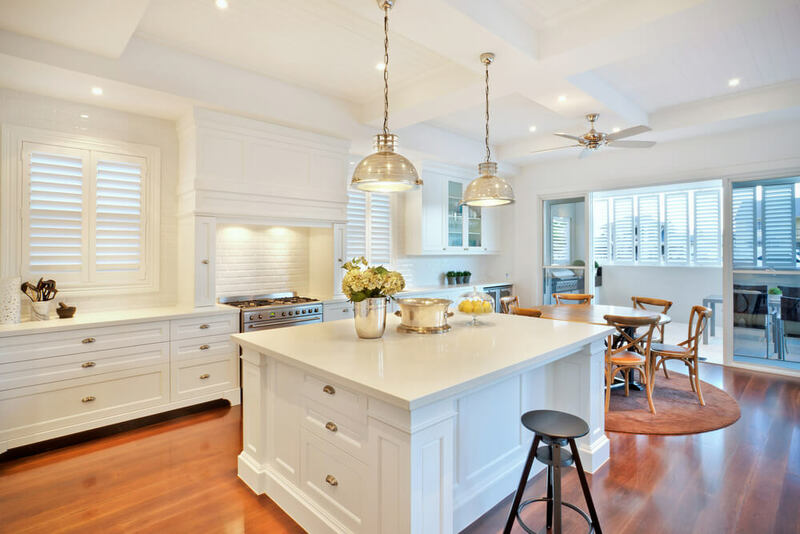 This elegant kitchen is characterized by lots of glossy, white cabinetry. The substantial island contains a cooktop, sink and an attached breakfast bar. 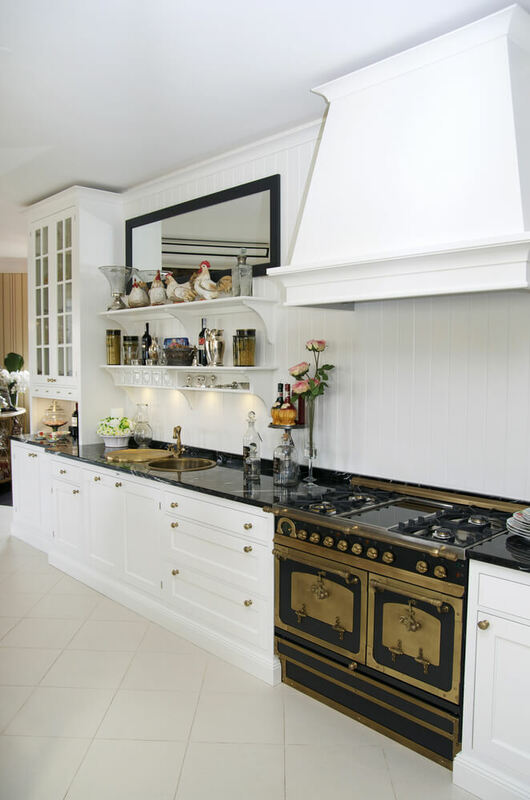 This country kitchen features a beautiful, vintage stove. Additional accents such as brass knobs, faucet and sink add to this rustic, country aesthetic. 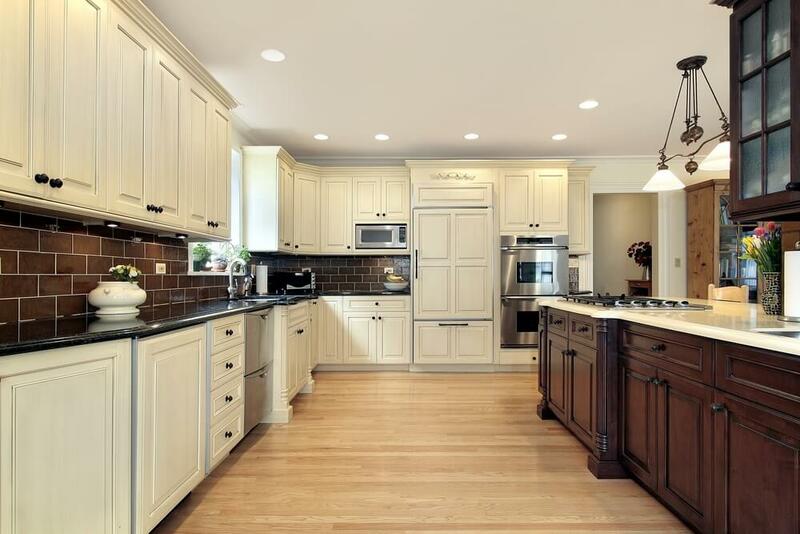 This kitchen features dark wood flooring and white cabinetry with inset panels. The large, built-in cabinet adds a focal point through its deep, gray-green color. 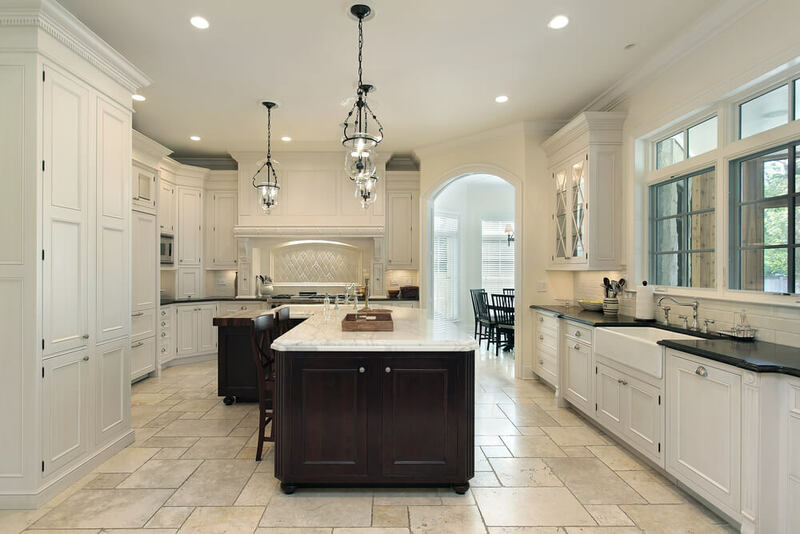 This kitchen features luxurious features such as a Carrara marble backsplash and variated stone floor. The considerable island has room to comfortably seat 6. 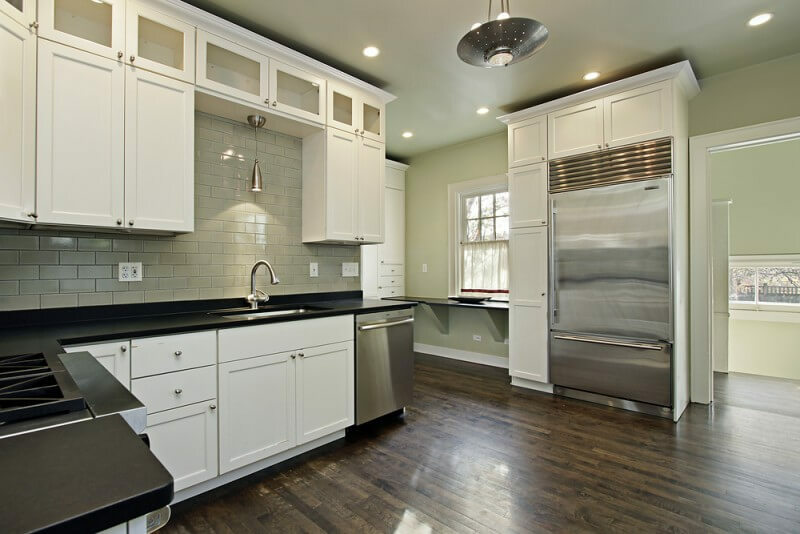 The white Shaker-style cabinetry and white subway tile provide a clean and crisp design aesthetic. The brass bin pulls, pendant lights and warm wood flooring add warmth to the space. 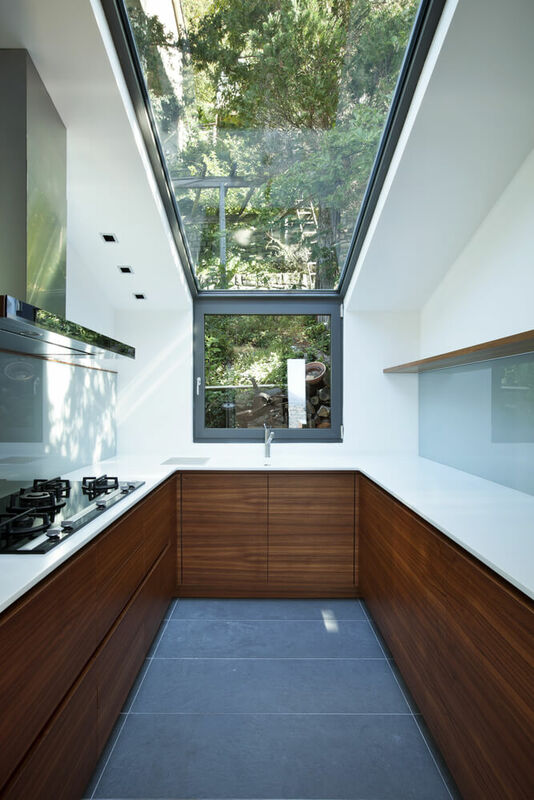 This u-shaped kitchen provides a spectacular view of the outdoors through a large skylight. The shape of the skylight reflects the shape of the floor below. 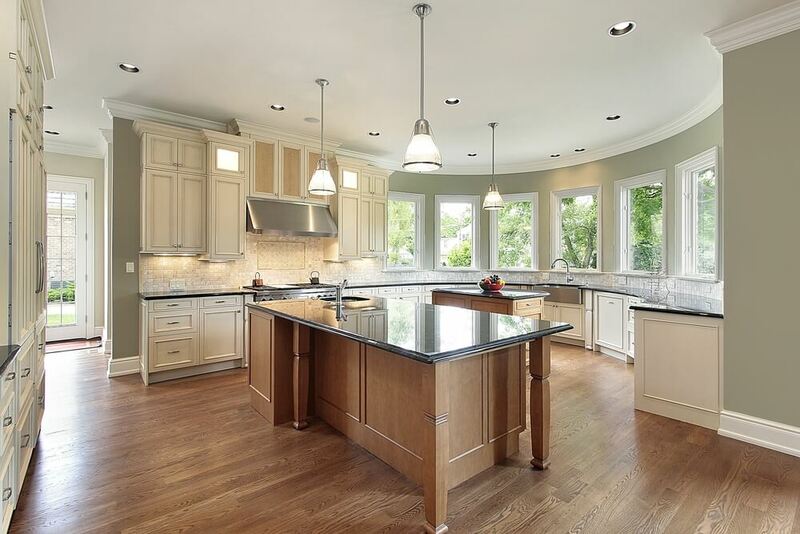 This impressive kitchen features a beautiful curved ceiling. The dark wood cabinetry and creamy gray countertop create a dramatic effect. 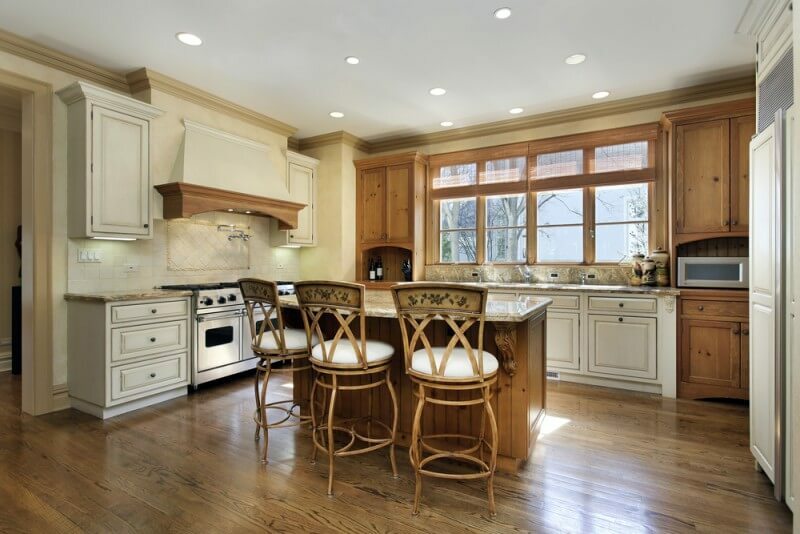 This kitchen is a chef’s dream with a sizable gas range, large island and plenty of counter space. The ceiling detail provides additional interest to the space. 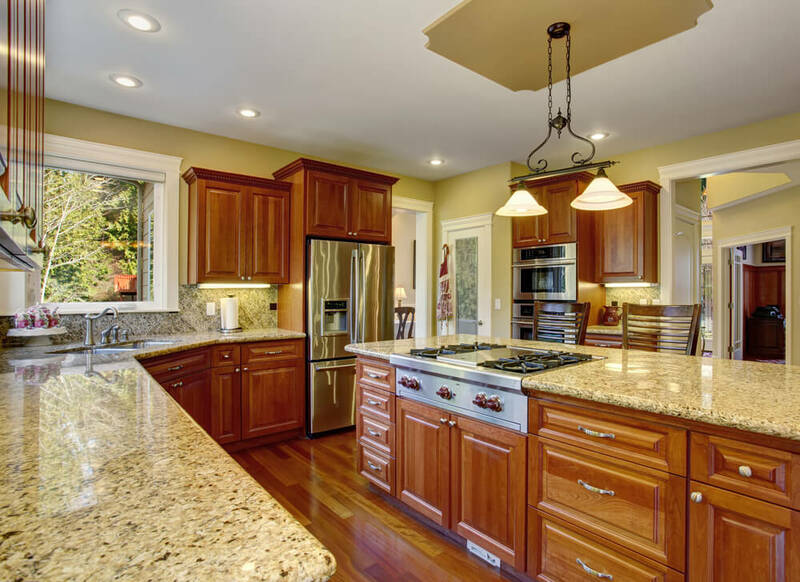 This kitchen features maple cabinets and black granite countertops. A breakfast bar is created by adding an additional level to the countertop. 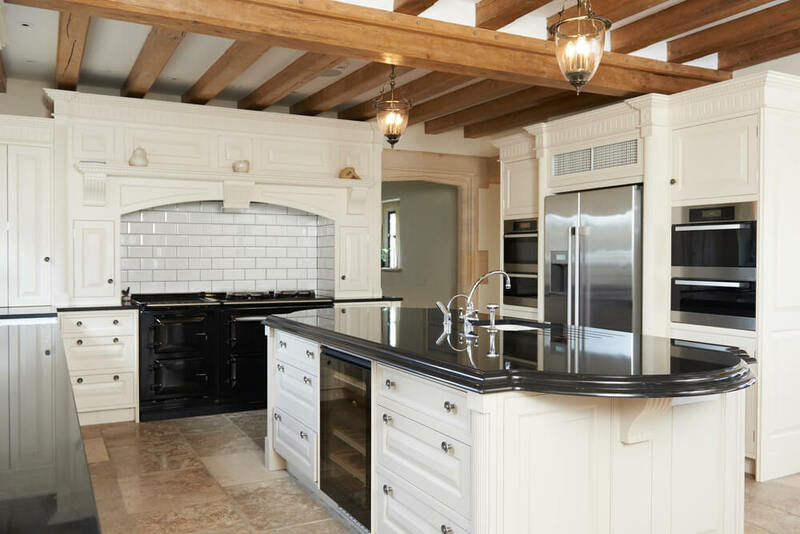 This kitchen features Shaker-style cabinetry and contrasting black knobs and handles. Glass front cabinets with integrated lighting provide a place to display favorite dishes and collectibles. 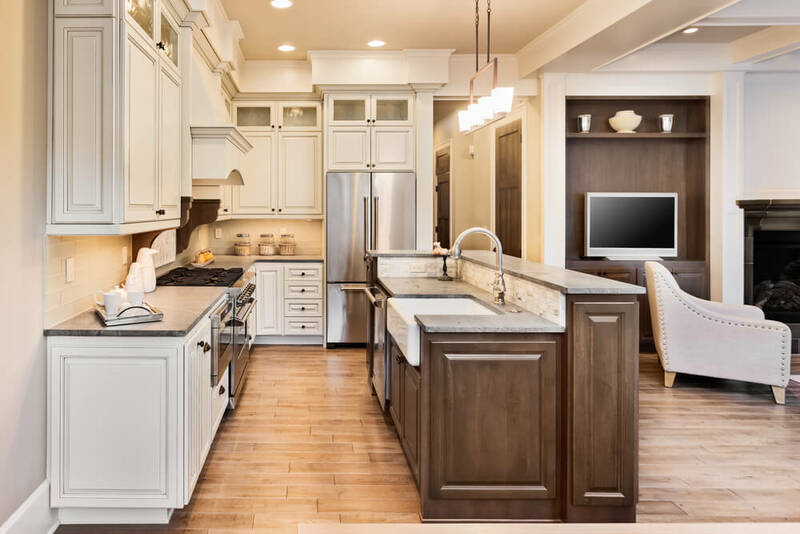 The large country kitchen contains custom wood cabinetry and a large pass-through to provide an opportunity for conversation between the main areas of the home. 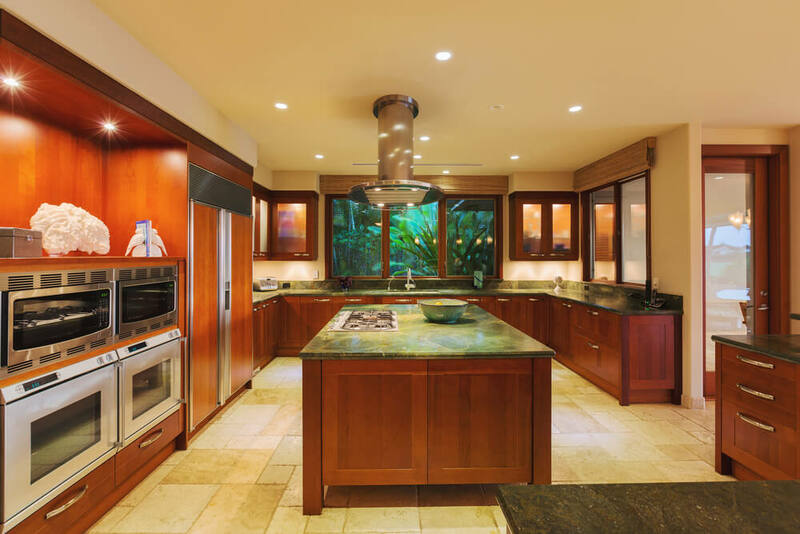 This large, contemporary kitchens provides ample space for a unique, island. The island features detailing that creates the appearance of age and significant wear. This kitchen’s inset cabinet doors feature a unique, paneled detail. 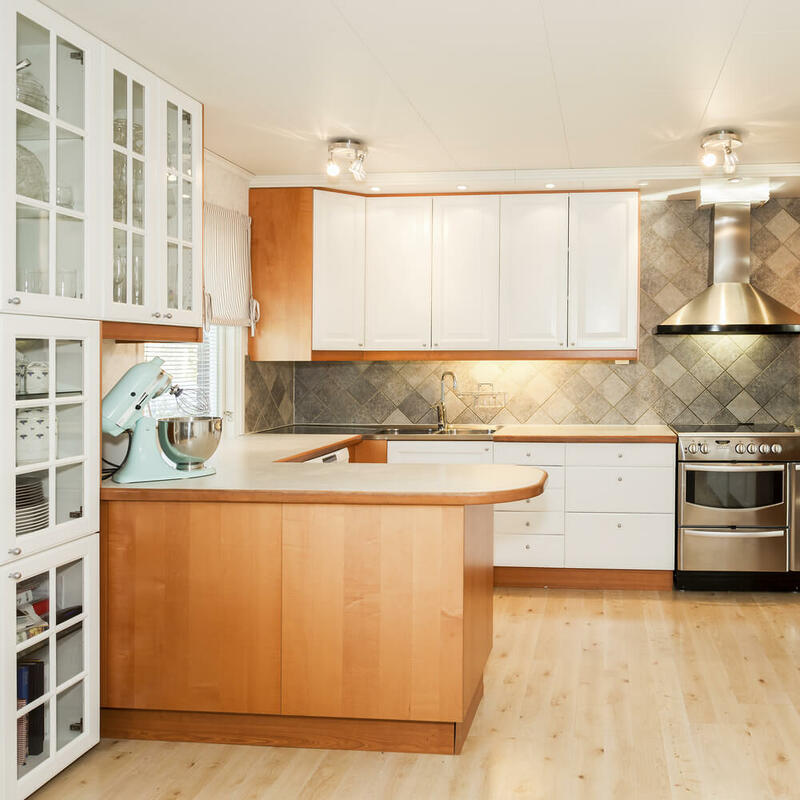 The rangehood with natural, wood-trim detail ties in nicely with the maple wood island. The abundance of cabinet storage space in this kitchen is an organizers dream. Plenty of space for maintaining a clutter-free kitchen. This contemporary kitchen features sleek wood cabinetry and a unique tile backsplash. The ceiling detail and trio of pendant lights draw the eye upright. 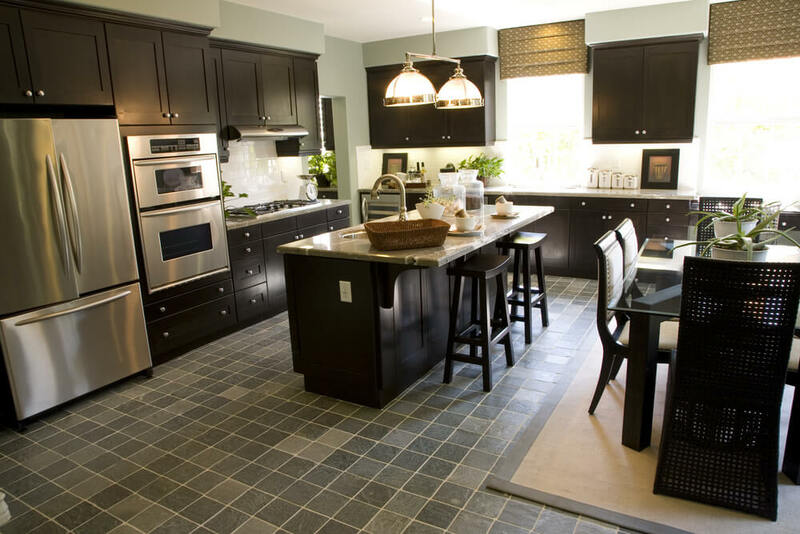 This kitchen features creamy, white cabinetry accent with a few dark gray pieces. The glossy backsplash adds a touch of sparkle to the space. A large window fill this kitchen with natural light. The simple white cabinetry contrasts beautifully with the textural backsplash. 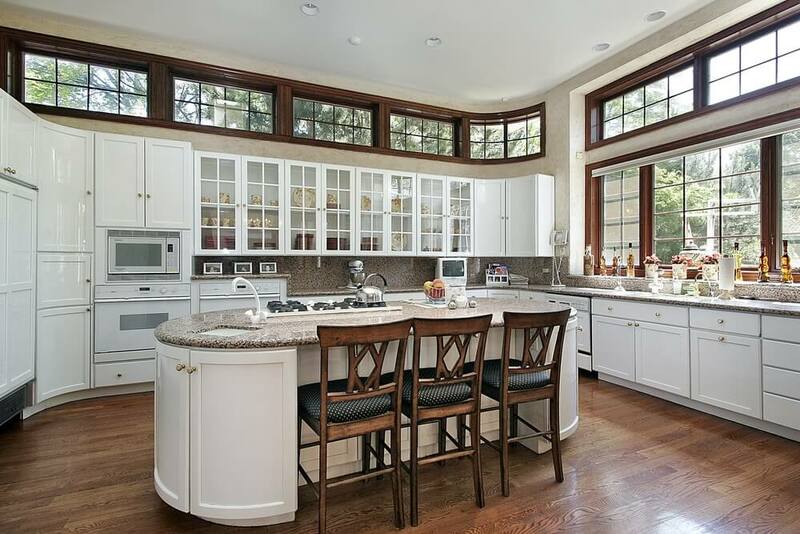 This kitchen features Shaker-style cabinetry and stainless steel appliances. A small desk area by the window serves as a breakfast bar or desk. 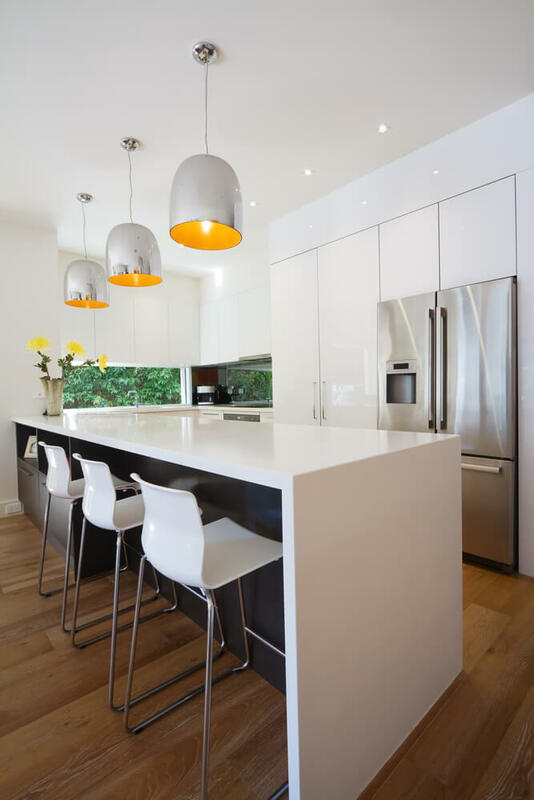 This modern kitchen is designed to appear seamless with frameless cabinet doors and sleek, built-in appliances. The custom rangehood doesn’t look like a rangehood at all, but instead an additional piece of cabinetry. 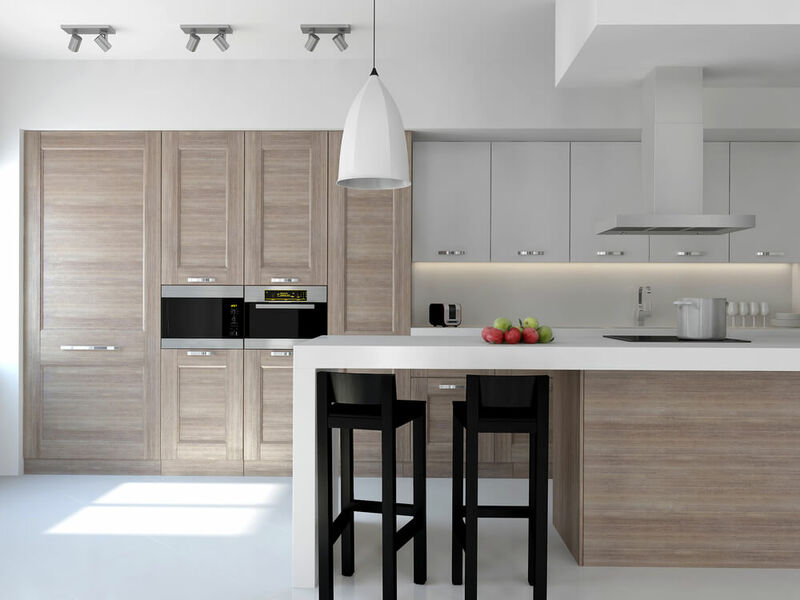 The combination of wood and white cabinetry, as well as the sleek modern cabinet design create a crisp, clean aesthetic in this modern kitchen. 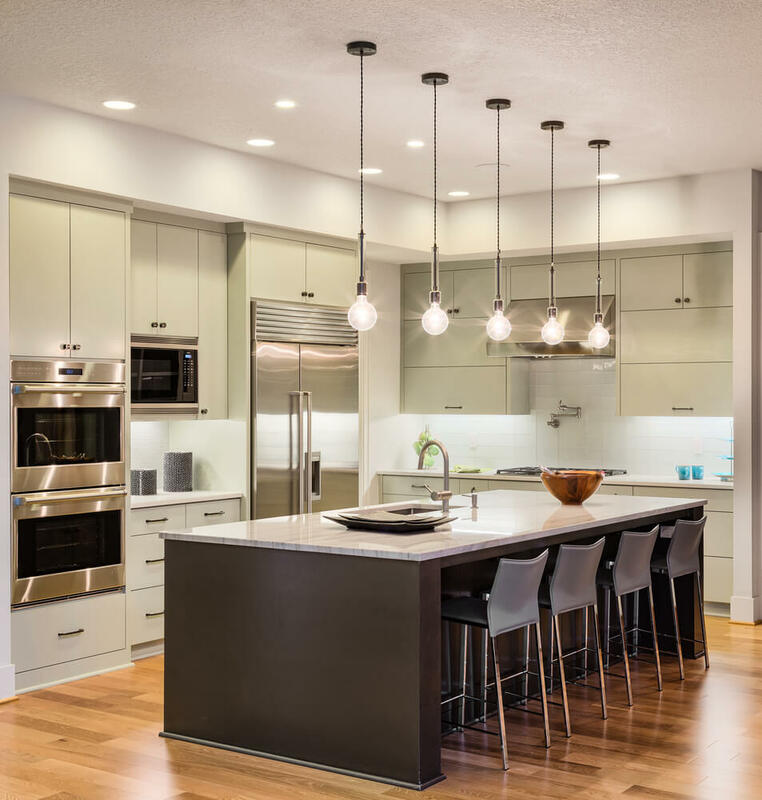 A variety of flush mount and pendant lights provides additional lighting for kitchen tasks. The black and white color scheme of this kitchen is dramatic and elegant. The wall of tile adds to the luxurious feel of the space. 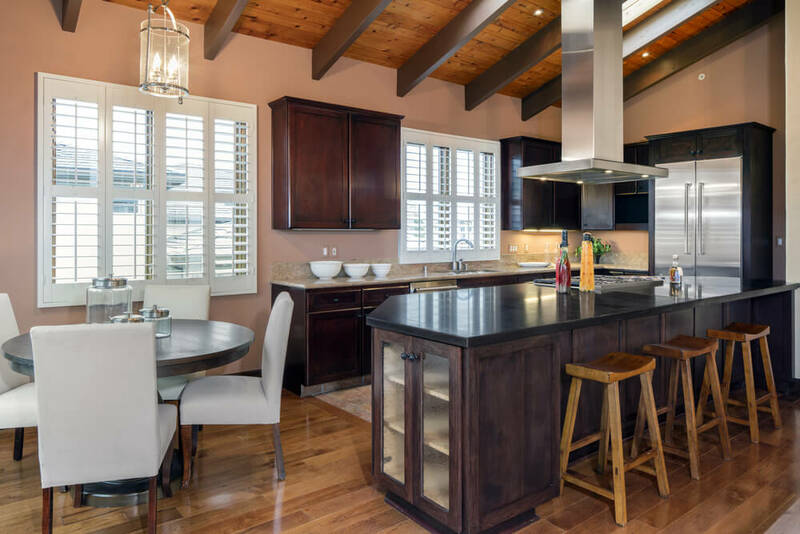 This kitchen features a beautiful, wood paneled ceiling. 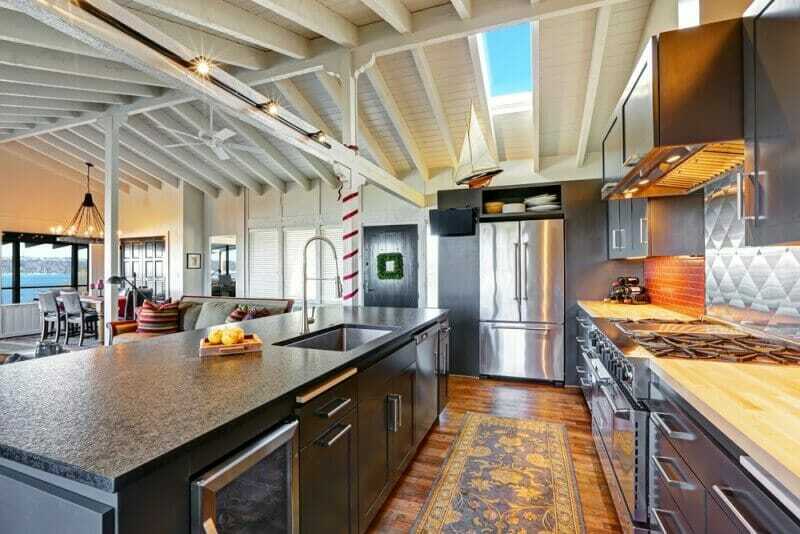 The warmth of the ceiling permeates this kitchen and creates an inviting place to cook and visit. 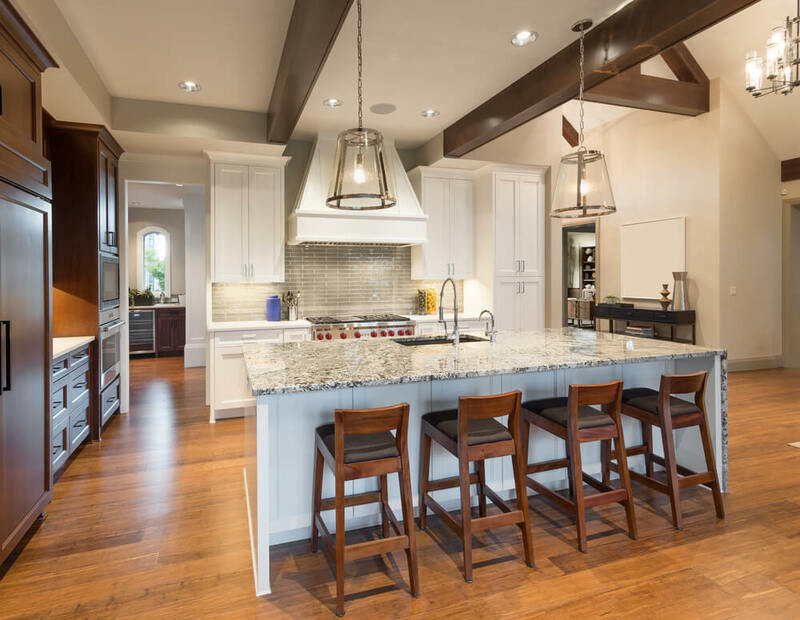 This expansive space features a huge kitchen island, farmhouse sink and custom cooktop surround. The large windows located above the sink provide the space with plenty of natural light. This bright and airy kitchen features green lower cabinets and white uppers. 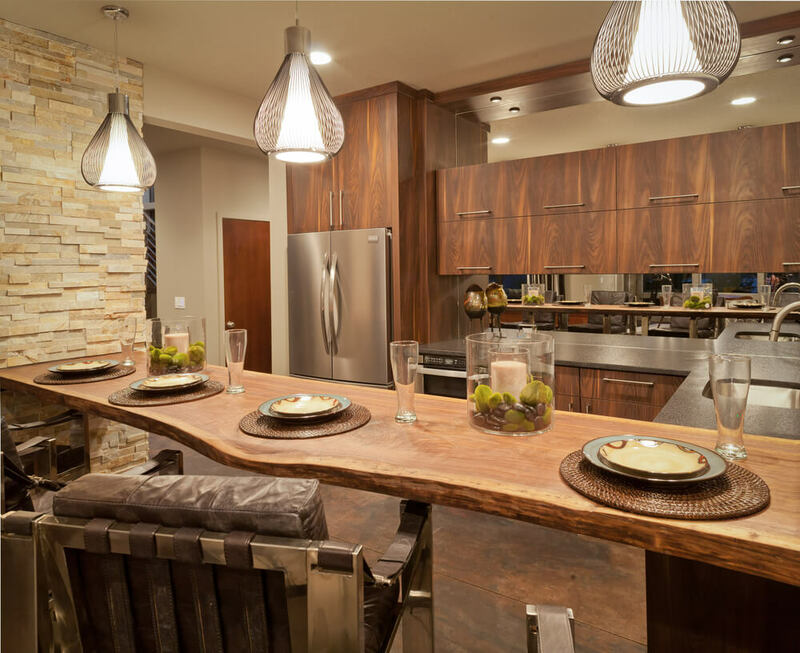 The stone countertop coordinates beautifully with the space by combining the color palette in one material. 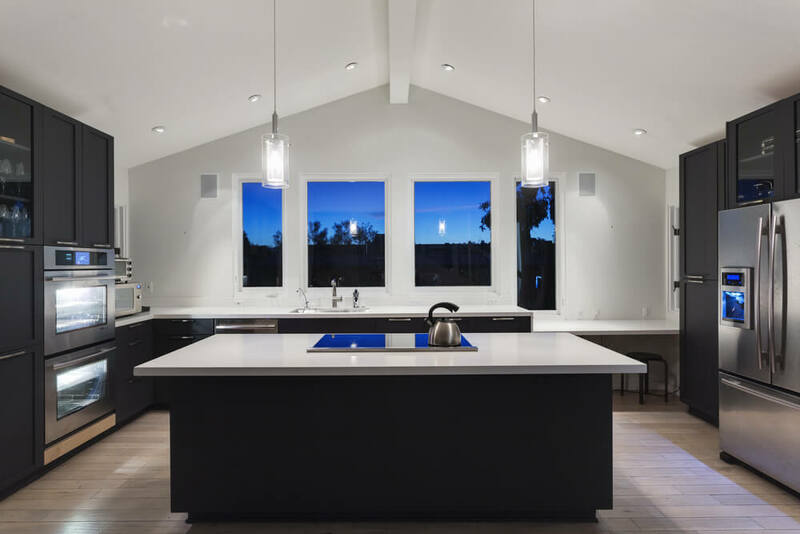 This kitchen provides a panoramic view of the outdoors and fills the space with copious amounts of natural light. The curvature of the wall, custom tile installation and stainless steel, farmhouse sink add personality to this luxury kitchen. 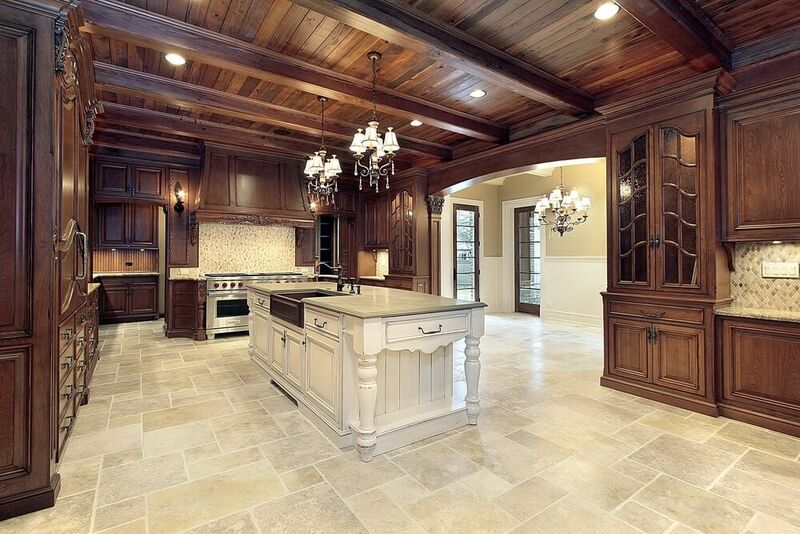 From the tilework to the custom cabinetry, this French country kitchen exudes luxury and elegance. The alcove surrounding the stove is an additional, special touch. 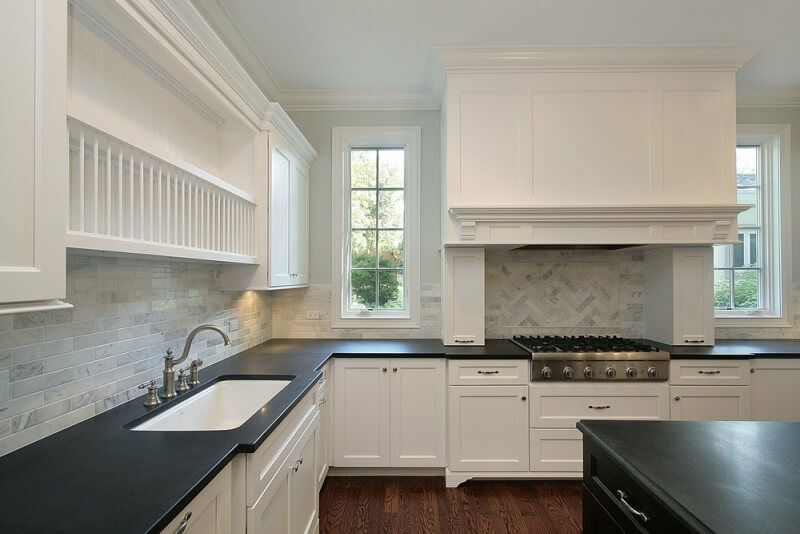 The dark countertops provide a striking contrast against the white cabinetry. The installation of an alcove and variation in the tile pattern create an subtle focal point. 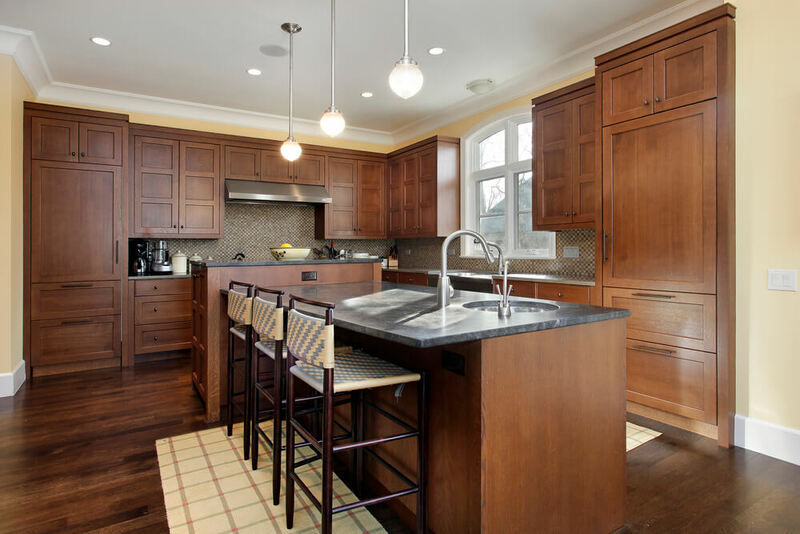 This kitchen features dark wood, custom cabinetry. 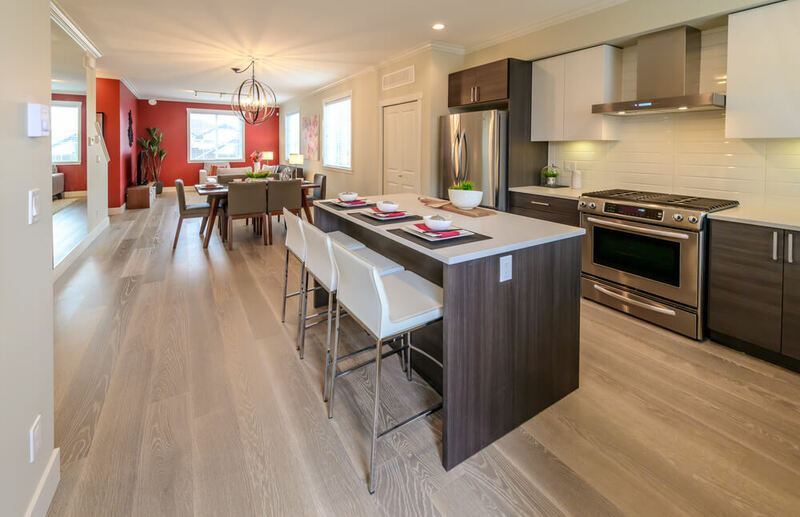 The light color palette of the island and flooring add contrast and lighten the space. 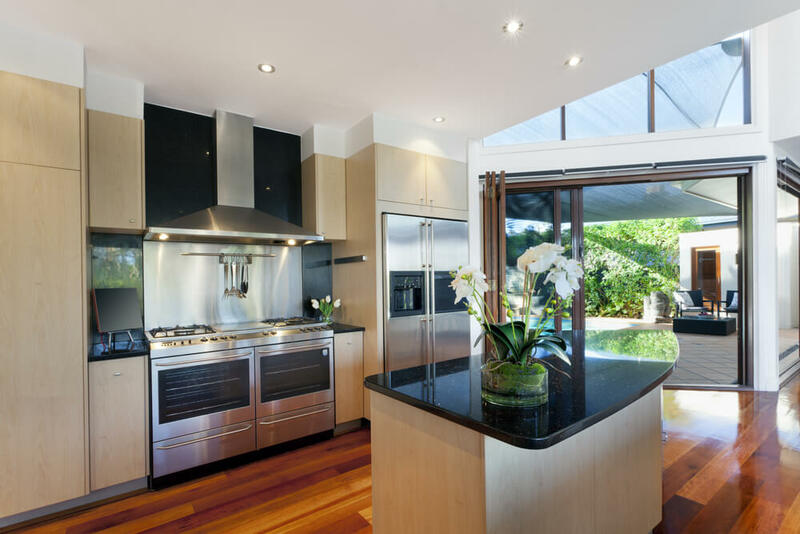 By installing windows, rather than cupboards, to flank the cooktop this kitchen remains open and airy. The island provides space for cleanup and prep, as well as a breakfast bar. The impressive detail surrounding the cooktop provides an imposing, yet beautiful, focal point for this luxury kitchen. A farmhouse sink and raised panel cabinetry provide a comfortable feel to the space. 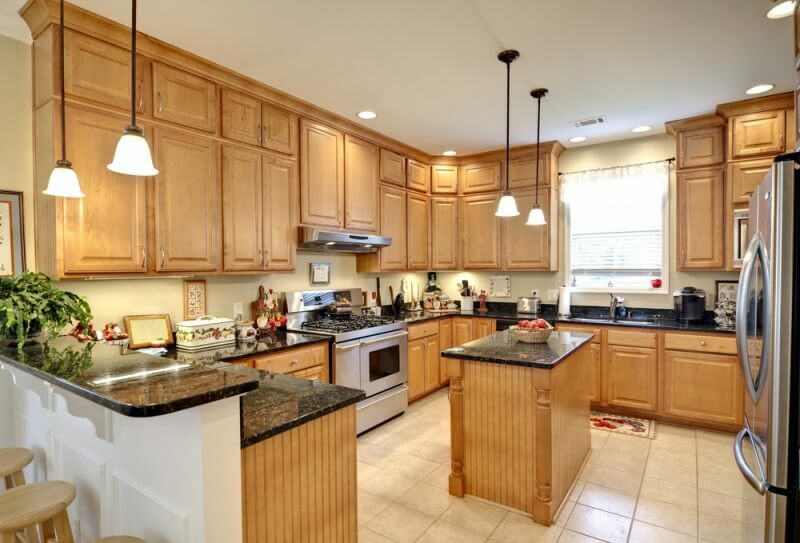 This kitchen features plenty of storage space, a large, gas cooktop and lots of space to perform kitchen duties. The tile backsplash provides a color palette to base the remainder of the space on. 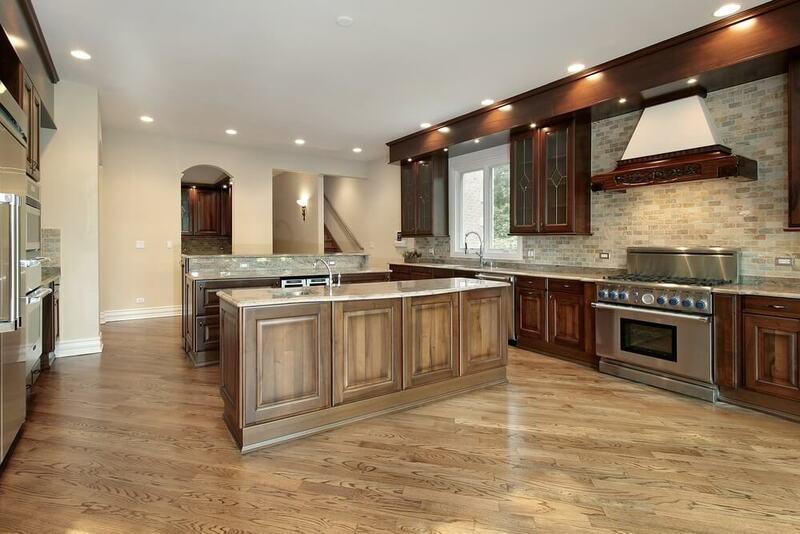 This kitchen features wide plank flooring, solid stone countertops and Shaker-style cabinetry. A double, undermount sink provides access to an easy clean up after each meal. 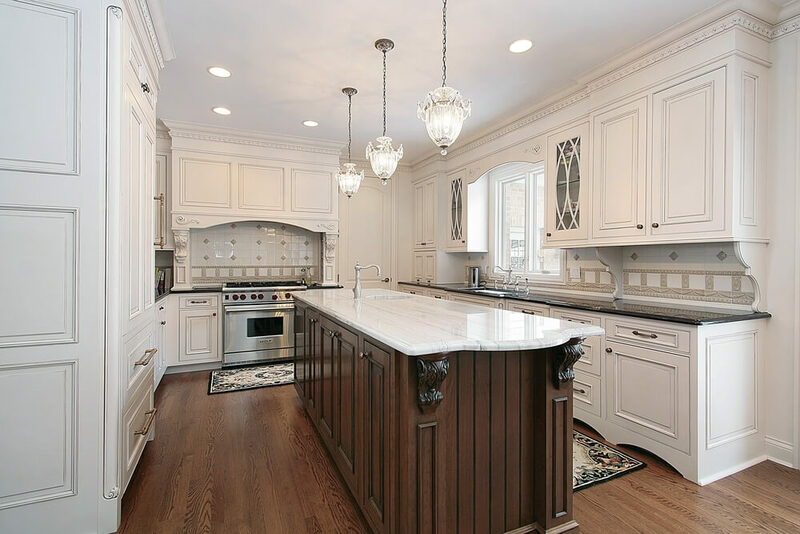 This kitchen features traditional cabinetry with inset doors and is styled to remain relevant for many years to come. The large wood island features a solid Carrara marble surface and additional sink for food prep. 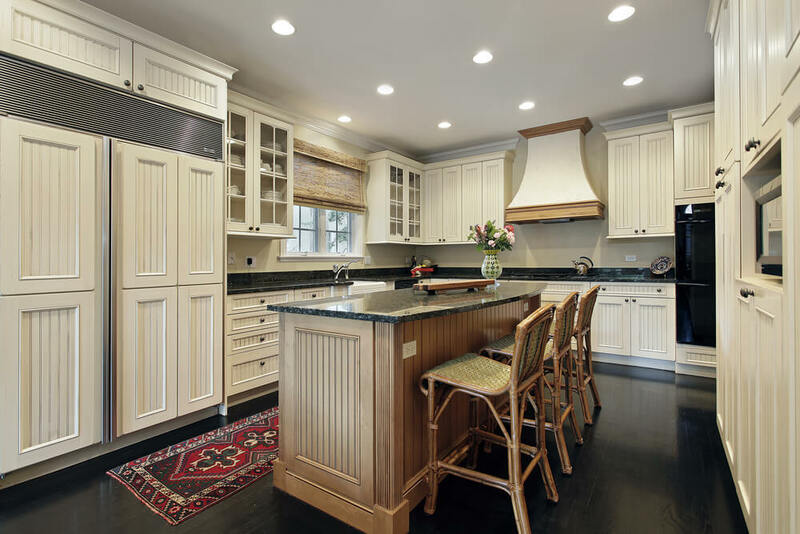 This classic kitchen contains a mix of painted and stained cabinetry. The dark brown backsplash references the color of the adjacent cabinetry and adds a dramatic detail. 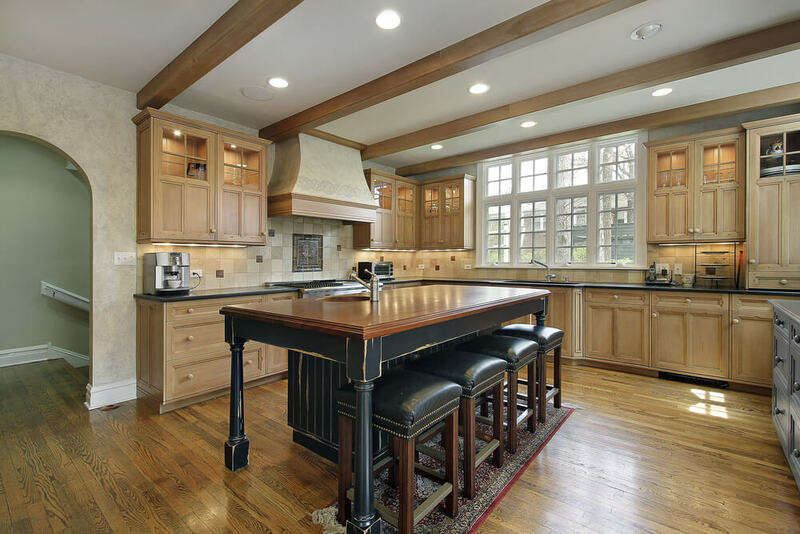 This kitchen features a custom rangehood, a corner appliance garage and a large, multi-level island. The natural stone flooring provides additional texture to the space. This custom kitchen features a lots of curved details which can be found in the corner cabinets and the shape of the island. The row of windows above the cabinetry ensures that lots of natural light is available to the space. 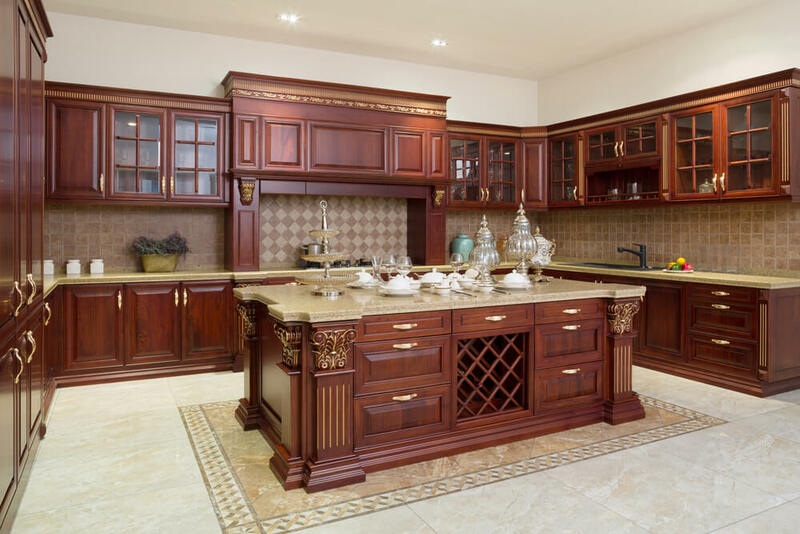 The deep cherry wood cabinetry in this kitchen adds richness and luxury to the space. The porcelain tile flooring is laid in an interesting diamond pattern. 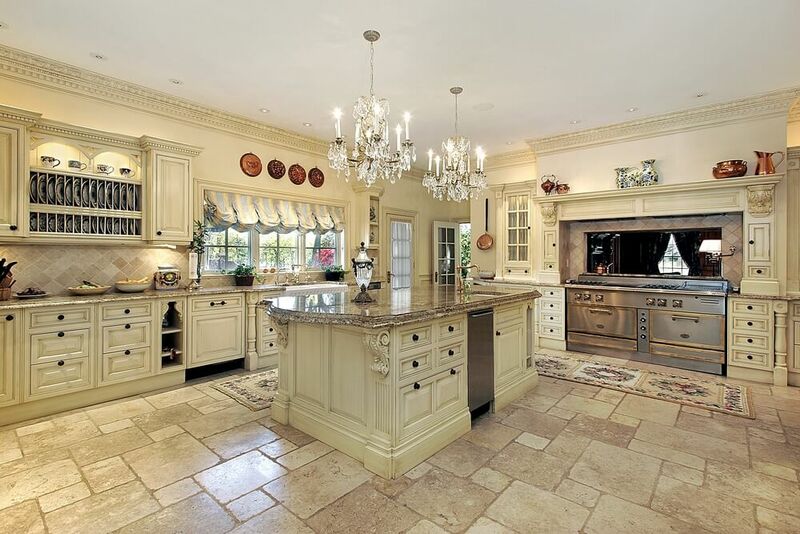 This expansive, French country kitchen features custom cabinetry and a massive, vintage cooktop. The custom alcove and mirrored backsplash surrounding the stove creates a true sense of luxury. 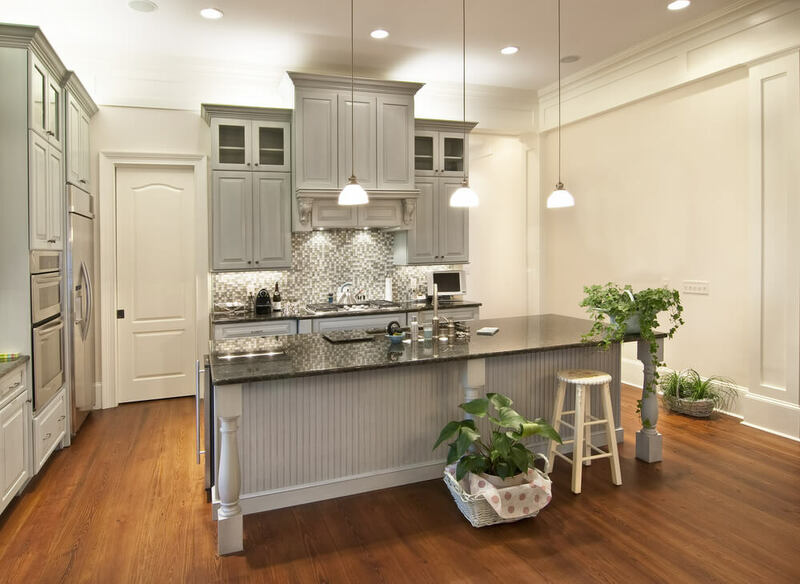 This space features a large island/breakfast bar with columns and beadboard detail. The range is accented by a beautiful multi-tone gray, mosaic backsplash. 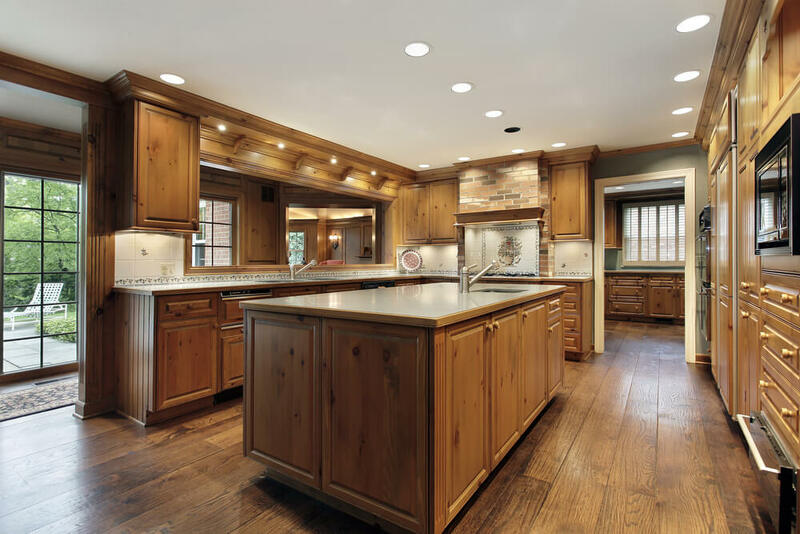 Wood plank flooring flows throughout this large kitchen. The tile is installed in a diamond pattern which continues onto the rangehood as well. 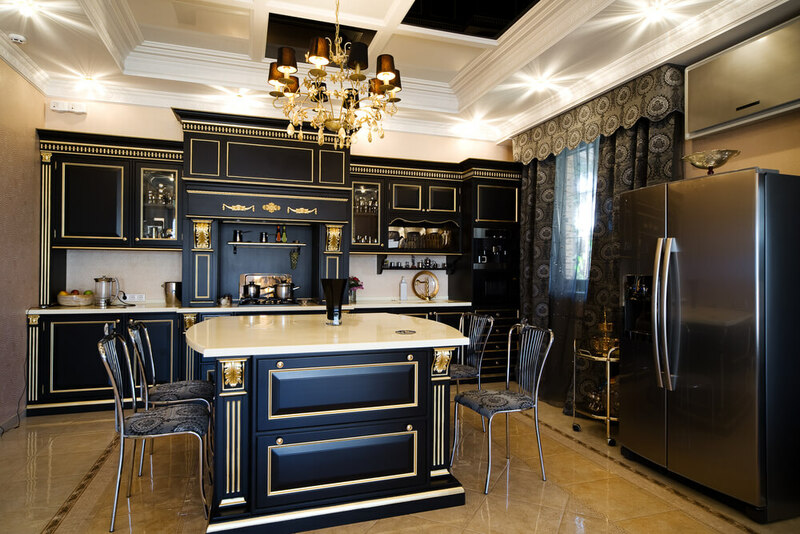 The black and gold detail of this kitchen make for a very dramatic space. The coffered ceiling and chandelier add to this effect. 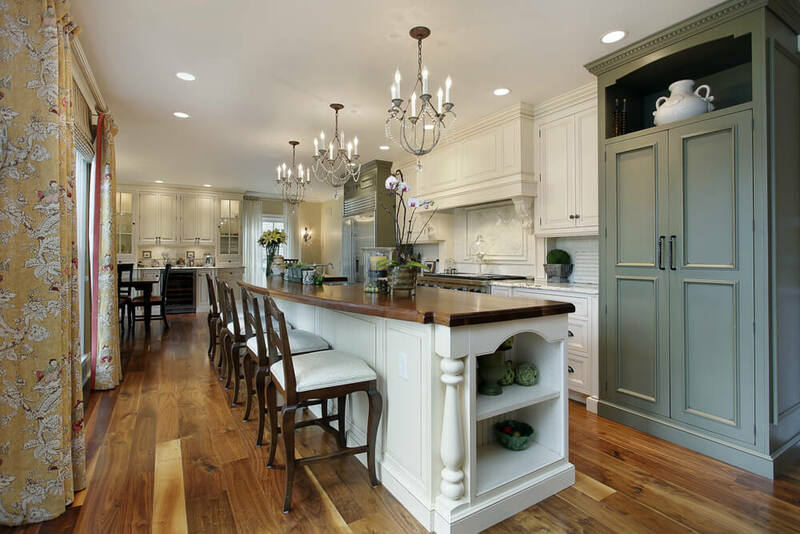 This French country kitchen features cherry wood floors and a custom island. The large wardrobe serves as a pantry and adds an eclectic feel to the space. 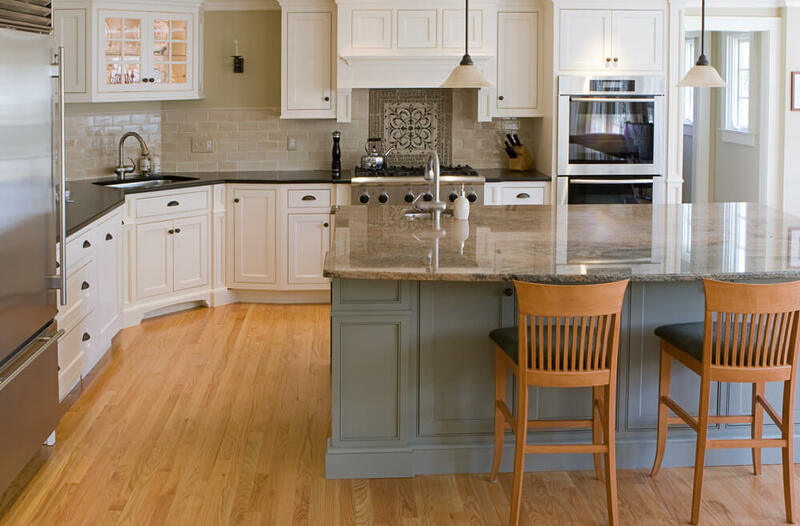 This kitchen features Shaker-style cabinetry and oak flooring. 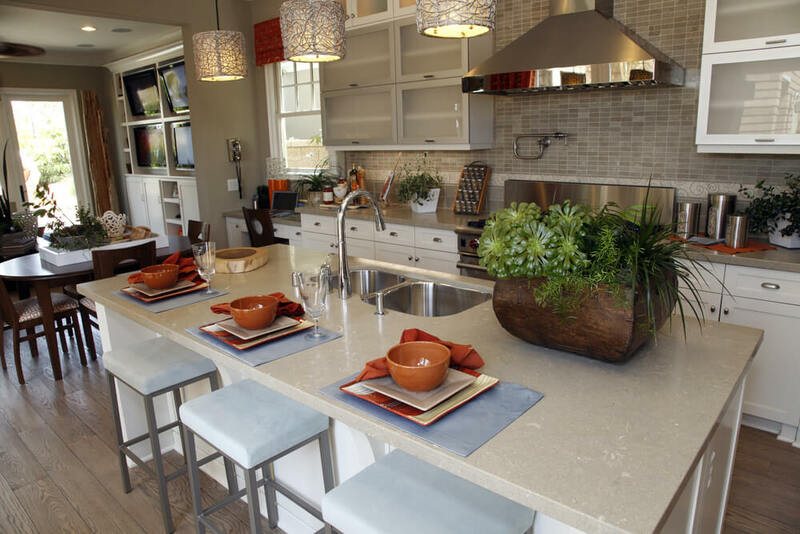 The island, painted a grey-blue, adds a splash of color while complementing the neutral color scheme of the space. 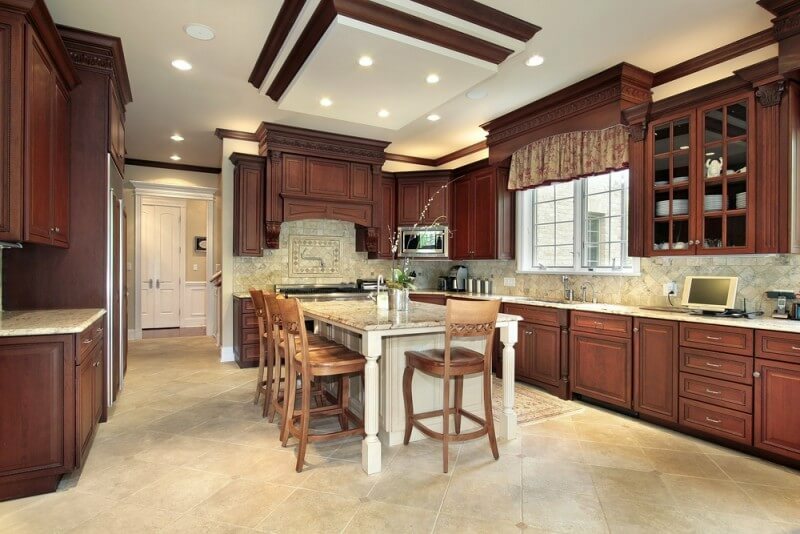 This dramatic kitchen features a u-shaped island with an inset breakfast bar. A niche in the wall allows for a portion of the cabinetry to blend into the space without taking up additional square footage. This Shaker-style kitchen features dark wood cabinetry, stainless steel appliances and a glossy, subway tile backsplash. The island includes an overhang ideal for a breakfast bar. This large alcove surrounding the stovetop is accented by tile installed in a diamond pattern, stone detail and decorative corbels. The curved island allows family and friends to sit and visit while the meal is being prepared. 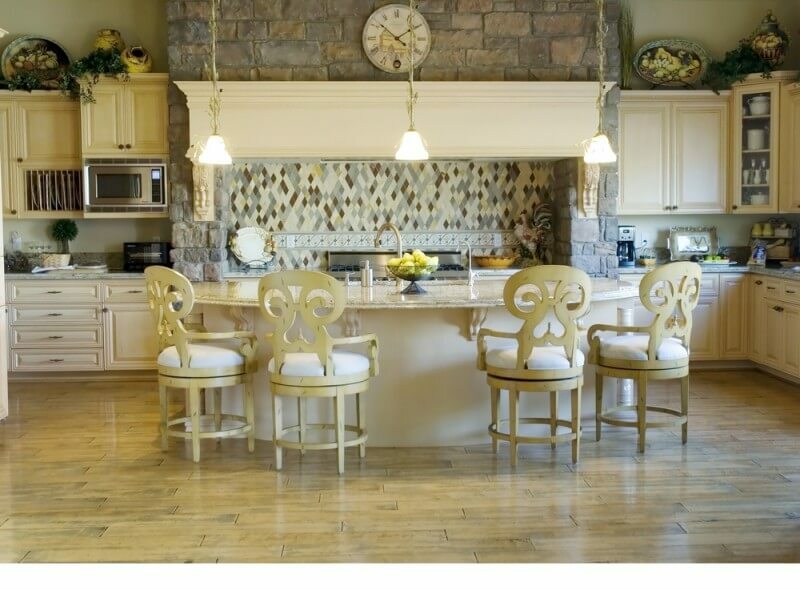 Rich, oak cabinetry and a mosaic tile backsplash convey a feeling of elegance and luxury in this kitchen. The drawer pulls and simplistic design reference the modern design accents found here.